Letters and Papers, Foreign and Domestic, Henry VIII, Volume 21 Part 2, September 1546-January 1547. Originally published by His Majesty's Stationery Office, London, 1910. Copy of his deed of resignation of the archdeaconry of Wells to Henry VIII. ; Dec. 26th 1546. "fo. 13." 615. William lord Grey to the Council. Hearing that certain Frenchmen were at Busheyn church and had not taken it of the King's Commissioners, I sent Sir Henry Palmer and Sir William Goodolphin thither; who found in the church Mons. de Bussheyn with his wife and family who said that his house "was near unto the church, a house place," but he had not taken it of the Commissioners, for both he and his neighbours the "parishons" of Busheyn were commanded by the procureur de Roy of Arde and by two Serjeants sent thither by Mons. Blerencort and Captain Dampont, to take no oath to the King our master until the Captain de la Garde should return out of England. To prove whether he meant to keep the church by force, Sir William Goodolphin asked him to dinner to-morrow; and after dinner they are to bring him to me, when I will gently command him and his neighbours to avoid the King's ground by a reasonable day. I beg to know what to do if they fail to go or if they return again by like order from Arde. Bulloigne, 26 Dec. 1546. Signed. Forwards a packet of letters received this day from Mr. Mounte which will certify the proceedings in Germany, where the Emperor is said to have "wondrously prospered." Trusts that Paget has received the two pieces of crimson velvet and white damask, and also a small vessel of Rhenish wine sent to him and my lady for a New Year's token. Sends herewith a token of six "coyffes" for my lady and six handkerchiefs for Paget, from his hostess at Bruxelles. His chimney tiles shall be made within 14 days. The young men of our Company (of whom I wrote), apprehended on suspicion of the murder of a broker here, I have got released upon surety, by means of the Emperor's ambassador's brother-in-law, one of the lords of this town. Pray thank the ambassador in such wise that his brother-in-law may know it, who may do me more pleasures hereafter if he knows his dealings to be well taken by the Council and you. It shall well appear that these poor merchants are wrongfully accused. Andwarpe, 26 Dec. 1546. 617. Thirlby to the Council. In pursuance of their letters of the 15th, received on the 24th, asked for audience; but the Emperor, receiving at this feast the Blessed Sacrament, wished to repose for three or four days and refused audience to all men. He however sent one of his chief secretaries, Joys Bauar, on Christmas Day, to whom Thirlby declared his commission, not forgetting the great benefits which these two ungracious men (fn. n1) had received. Joyse having heard this, and "in by-talk, the busy head of the father and the pride of the son," said he would declare the matter to the Emperor incontinent. Ought to write to the King, but thinks it unwise to renew the memory of this "ingrate malice"; and so, most humbly upon his knees, begs them to be intercessors for his pardon herein. Halebrun, 26 Dec. 1546. Meeting at Ely Place, 27 Dec. Present: Chancellor, Great Master, Privy Seal, Great Chamberlain, [Admiral, Browne, Paget]. Business:— Letter to Deputy and Council of Boulogne that, whereas the King ordered them to advertise monthly the numbers of the garrisons in each piece, the money remaining in the Treasurer's hands and the state of the victuals, his Majesty marvels that for four months they have not done so; he had no knowledge of these important matters save Mr. Aucher's account of the victuals; they seem, from the highest to the lowest to have been too busy embracing farms for pasturage, chopping and selling them (even into France), to remember his service; he trusted to hear no more of such greediness, and that the Treasurer would advertise hither the numbers of garrisons and the store of treasure; and, finally, all houses appointed by their device, with that of Mr. Rowse and Mr. Aucher for stowage of victuals should be at once voided and put ready for victuals, any leases notwithstanding Letter to Lord Stourton to make ready the long house prepared by Mr. Aucher for victuals. To Mr. Cavendisshe, captain of Blacknesse, to make ready the house there. To Rogers, surveyor of Boulogne, to make a bakehouse (described), adjoining the brewhouse at New Haven. 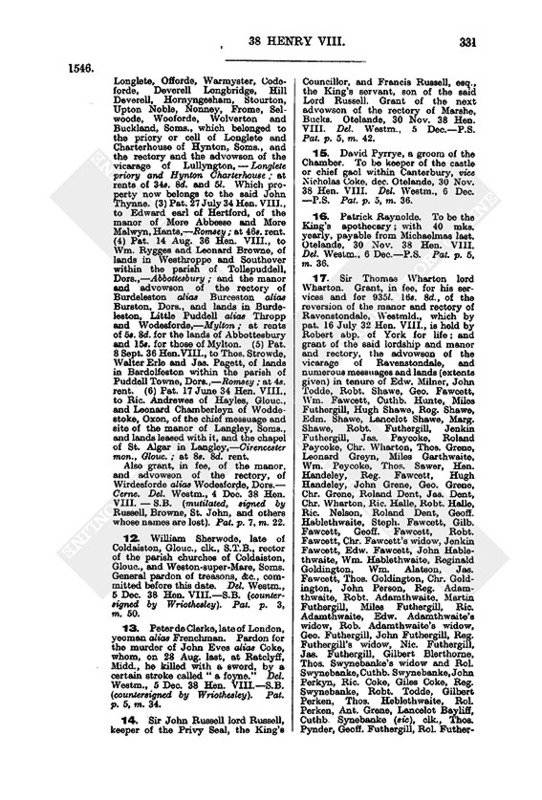 Richard Knight and William Kettyll had warrant to Peckham for 7,000l. and to Williams for 3,000l. to be employed by the Lord Great Master on provisions. Ant. Bonvixy and Anceline Salvage had warrant to Peckham for l,000l. towards payment of the King's debt in Flanders in February. Bart. Fortuny and Bart. Campaigne had the like. Broke, paymaster of works at Dover, had warrant to Carew for 400l. Letter to Sir Thomas Seymour to deliver Lord Sturton, for the new fort at New Haven, certain ordnance (specified). Francis Flemyng and Anthony Anthony had warrant to Cavendish for 121l. 7s. 8d. towards munition for Wark and Boulogne; and Flemyng a warrant for 200l. towards making the Ordnance House in the Tower. "Parson Levet had commission to oversee the iron mines in Sussex which appertained to the duke of Norfolk." Ant. Aucher had warrant to Williams for 2,000l. for grain for Boulogne, etc. Letter to Treasurer of Berwick to pay Ralph Fenwyk a 40s. pension from the death of the last holder. 619. The Privy Council to Wotton. The King, upon seeing Wotton's letters to himself and to Paget touching Norfolk's matter and the staying of "their" (i.e. the French) courier at Dover, approves his doings. Albeit the laws forbid any person to carry money out of the realm, couriers and posts going in princes' affairs have always been favoured; and therefore the King is very ill pleased with the searcher of Dover, whom the Council are to send for and correct. 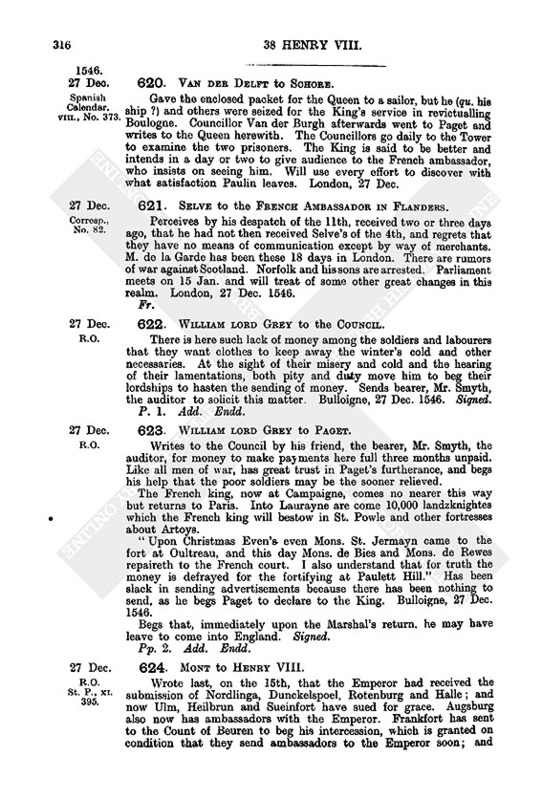 Where it appears by Wotton's said letters that ambassadors are come thither from the Protestants, accompanied by Dr. Bruno, and are shortly to repair hither also; their coming is probably "but for one thing," and Wotton must set Bruno to make them induce the French king to enter league with them first, for, otherwise, if the King should enter league with them the French king might "slip to the Emperor." The French ambassador and Polino, separately, with letters of credence, have had access to the King. The Ambassador's credence was for the comprehension of the Scots; and the King answered that he thought the Scots could not claim the benefit of the comprehension, but he would do as the treaty bound him, and, for his love to his good brother, it would be the Scots' fault if things went not well. Polino's charge referred to the fortifications, the limits and the galley, he saying that his master, having now heard both sides, would make the King judge in the matter of the fortifications. As to the limits, we see no cause for parting with Villemontyer, and are to talk with them again to-morrow therein; and for the galley we answered so fully that they will take her either by gift or justice. The King lately, "upon some grief of his leg, was entered into a fever"; but he is now well rid of it and we trust that he will be the "better for it a great while." Draft, pp. 4. Endd. : The Counsaill to Mr. Doctor Wootton, — (blank) Decembr' 1546. 620. Van der Delft to Schore. Gave the enclosed packet for the Queen to a sailor, but he (qu. his ship?) and others were seized for the King's service in revictualling Boulogne. Councillor Van der Burgh afterwards went to Paget and writes to the Queen herewith. The Councillors go daily to the Tower to examine the two prisoners. The Bang is said to be better and intends in a day or two to give audience to the French ambassador, who insists on seeing him. Will use every effort to discover with what satisfaction Paulin leaves. London, 27 Dec.
621. Selve to the French Ambassador in Flanders. Perceives by his despatch of the 1lth, received two or three days ago, that he had not then received Selve's of the 4th, and regrets that they have no means of communication except by way of merchants. M. de la Garde has been these 18 days in London. There are rumors of war against Scotland. Norfolk and his sons are arrested. Parliament meets on 15 Jan. and will treat of some other great changes in this realm. London, 27 Dec. 1546. 622. William lord Grey to the Council. There is here such lack of money among the soldiers and labourers that they want clothes to keep away the winter's cold and other necessaries. At the sight of their misery and cold and the hearing of their lamentations, both pity and duty move him to beg their lordships to hasten the sending of money. Sends bearer, Mr. Smyth, the auditor to solicit this matter. Bulloigne, 27 Dec. 1546. Signed. 623. William lord Grey to Paget. Writes to the Council by his friend, the bearer, Mr. Smyth, the auditor, for money to make payments here full three months unpaid. Like all men of war, has great trust in Paget's furtherance, and begs his help that the poor soldiers may be the sooner relieved. The French king, now at Campaigne, comes no nearer this way but returns to Paris. Into Laurayne are come 10,000 landzknightes which the French king will bestow in St. Powle and other fortresses about Artoys. "Upon Christmas Even's even Mons. St. Jermayn came to the fort at Oultreau, and this day Mons. de Bies and Mons. de Rewes repaireth to the French court. I also understand that for truth the money is defrayed for the fortifying at Paulett Hill." Has been slack in sending advertisements because there has been nothing to send, as he begs Paget to declare to the King. Bulloigne, 27 Dec. 1546. Begs that, immediately upon the Marshal's return, he may have leave to come into England. Signed. 624. Mont to Henry VIII. Wrote last, on the 15th, that the Emperor had received the submission of Nordlinga, Dunckelspoel, Rotenburg and Halle; and now Ulm, Heilbrun and Sueinfort have sued for grace. Augsburg also now has ambassadors with the Emperor. Frankfort has sent to the Count of Beuren to beg his intercession, which is granted on condition that they send ambassadors to the Emperor soon; and yesterday all the orders consented to the choice of an embassy. The Elector Palatine has now followed the Emperor for three weeks, and is said to have difficulty in obtaining grace, because he aided the Protestants with 300 horsemen and two standards of footmen. William Duke of Bavaria intercedes for the Duke of Wirtenberg; but the Emperor insists on that Duke ceding his rule to his son Christopher, who has not yet favoured the religion of the Protestants and is son of the said William's sister. So now the Smalcaldic league is in great part dissolved. Four days ago the Count of Beurn arrived in the county of Catzenelnbogen possessed by the Landgrave, with 4,000 horse and 8,000 foot, and compelled the principal places to submit, taking Darmstat at the third assault. This county has a fortress ad Menum, which is garrisoned, and seems willing to undergo a siege. By the way Beuren mulcted in a heavy sum the Counts of Erpach whom the Palatine had sent with other horsemen to the Protestants. The Landgrave is at Cassel, too weak to repel such a force; for the Emperor is not far from the Count, who has almost all the cavalry with him. The cities of Upper Germany, weary of war and drained of money, will accept any conditions, their religion saved, which the Emperor promises to put to the judgment of a Council, either general or national; and they successively seem as though they would be little help to the Hessian or the Saxon. The Duke of Saxony has recovered some of the places occupied by Maurice. What will be the lot of these princes is still uncertain. They have the favour of many, especially evangelicals, but the present strength of the Emperor compels the cities to seek their own safety. Datum Oxonie, 27 Dec. 1546. Signed: Bergottus. Has signified to the King the doings in Upper Germany, and cannot see what to expect but adversity and grief from these sorrowful tendencies; for those whose money sanctioned and prepared this war will have the fruition of the victory, and in their lust and superstition give laws to the vanquished. But although the conquering cause may please men, undoubtedly the conquered is more pleasing to God, who will not have His glory established by human power, nor delighteth in the strength of a horse or the legs of a man, who also bringeth down and setteth up, and whether we die or live we are His. The Count of Beurn is now three miles hence; for Catzenelnbogen adjoins this city which is now ill fortified, the Main which flows by the one side and the moat on the other being joined by the ice and passable to the enemy. Ambassadors have been sent to the Emperor; and to-day Reyffenberg sought admission with ten standards of footmen, which has been denied. The cities of Upper Germany are more desirous of peace than of war, seeing great expenses and vast forces hitherto nothing avail. Commendations to Mr. Peter your colleague. Datum Oxonie, 27 Dec. 1546. Signed: Bergottus. Lat. Hol., p. 1. Add. Endd. 626. Somerset Herald to Paget. Since leaving the Emperor's Court I have learnt that Count Gyllam was chief worker to persuade the commissaries at Ulmes to withdraw their goodwill from the Landgrave, and caused Ulmes to surrender. The Landgrave marched away with 42 ensigns of footmen and 3,000 horsemen in good order, and still keeps that army together. Passing homeward, he let his soldiers sack all cloisters and priests. He is said to be in his own country and to have privily received money from the French king to keep his men together till next spring. The Emperor likes not the Landgrave's retaining of men and getting so much money homeward, which is bruited to be above 200,000 dalders. The Count Bure has sacked the Landgrave's town of Armystat and marches towards the rest of his dominions. "It seemeth that there is some things that contenteth not the French king, for within these eight days his ambassador here with the Emperor hath despatched three posts, one in another's neck." I caused my lord of Westminster to despatch my fellow Blewmantell, as able to declare the "discourse" of affairs during this war, he having been present when any notable thing was done. I would desire you to help him to some allowance for his painful travail, almost these two years, with my lord of Westminster, "for by his absence he hath lost his preferment for his exchange of his room in our office." As soon as I have been at Strawsburghe and learnt the truth of matters I will return to his Highness. Spyers, 27 Dec.
627. W. lord Stourton to Paget. This bringer, Peter Marten, leader under me of the horsemen here, is in trouble for one Thomas Powell, dec. Marten and Powell being fighting together, one John Graye, a Scotchman, as divers credible persons say, struck Powell on the head behind; and Powell himself said next day that it was not Marten who struck him, but "another that came behind him." Powell's friends, however, sue the said Marten. Begs favour for him, and trusts that if pardoned this offence he will do good service here. New Haven, 28 Dec. Signed. P. 1. Add. Endd. : 1546. 628. Hermann Archbishop of Cologne to Henry VIII. In commendation of Caspar a Weda, who desires to enter the King's service, and who was brought up in the writer's house and distinguished himself in the command of those troops which the writer in past years sent against the invasion of the Turk. Poppelstorff, 28 Dec. 1546. Subscribed: Hermannus Dei gratia archiepiscopus Coloniensis, Princeps Elector, Westualie et Angarie dux, administrator Paderbornensis, etc. Lat. Hol., broadsheet, p. 1. Add. Meeting at Ely Place, 29 Dec. Present: Chancellor, Great Master, [Privy Seal, Great Chamberlain, Admiral, Browne, Paget]. Business: Warrant to Williams to pay Mr. Mason and Mr. Goderyk, for three journeys into Norfolk, 30l. 13s. 4d. Letter to President and Council in the North that the King pardoned the two Sacramentaries whom they affirmed to be now penitent on condition of their making open recantation. 630. The Privy Council to the Council in the North. The King has seen their sundry letters, and thanks them for their proceedings in the musters and the sessions. The two Sacramentaries (fn. n2) convicted at the said sessions, who repent their offences the King is content to pardon, provided that they recant openly and forsake their former opinions; and if bills for that purpose are sent up the writers "will procure the same to be signed accordingly." Westm., 29 Dec. 1546. Signed by Wriothesley, St. John, Russell, Hertford and Paget. Modern copy (18th century), ½ p. Address copied: To, etc., the Archbishop of York, president, &c, and the rest of the Council there. 631. Sir Roger Touneshend to Sir Wm. Paston. My lord of Sussex has this day sent me letters from the King's Council addressed to him, you and me, for the speedy collection of the Contribution granted to the King. Sends copies of both letters (from Sussex and the Council). Where his Lordship writes that we should wait upon him before Twelfth Day with the collectors, I have answered (copy enclosed) that it is meet to give the collectors notice "undelaidlye," that at next Norwich sessions they may declare their accounts, "and of all recusants mentioned in the said letters"; so that we may proceed according to the tenor of the letters. Please give knowledge to Thomas Woodhouse, one of the said collectors, to keep his day at the sessions. I have written (copy enclosed) to John Dethike, the other collector. 29 Dec. 1546. Signed. P. 1. Add. : one of the King's Majesty's most honorable Council Endd. 632. Frederic Count of Weda to Henry VIII. Complains that Frederic a Reiffenberg, "proxime exacta æstate," for the King's service raised an army in the writer's county, and by remaining there longer than was right has utterly ruined his people. Encloses a letter from the eschevins of Andernacken testifying this. Would have given 1,500 gulden to be quit of them, and his only hope is now in the King's clemency. His kinsman, the bearer, can declare what passed; and if further proof is wanted he refers to his brother german the Archbp. of Cologne, and to the princes and counts his neighbours. Bonn, 29 Dec. 1546. Signed: Fredericus Comes a Weda, etc. Lat., pp. 2. Add. Endd. Fredericus Comes a Wida. 633. Diego Hurtado de Mendoza to Charles V.
The Signory has appointed Navagero, formerly ambassador to the Emperor, ambassador to England. Has twice reported that they were discussing this, and that it was a trick of the English and French to which the Pope was suspected to be a party; also that Cardinal Farnese said that the Pope would send him to France to negociate peace with the Emperor. It may be concluded that this ambassador goes to negociate some league between France, England and this Signory. This government is in the hands of persons ill affected to the Emperor, mostly young, some very poor and some very rich. The poor want change in order to enrich themselves, while the rich are afraid of the Emperor. There are two Councils, one called the Council of Petitions where things are finally settled, and which does not want war with the Emperor, the other the Council of Ten where matters are prepared for decision. This latter is ill disposed to the Emperor and frequently deceives the other. Venice, 29 Dec. 1546. 2. Details of an interview between Mendoza and the Signory.Mendoza complained that they tried to dissuade the Pope from joining the league against the Lutherans, advised the Protestants to hold out four months, were in close communication with Lutherans, and moved the Turk to attack Hungary; all which charges they specifically denied. 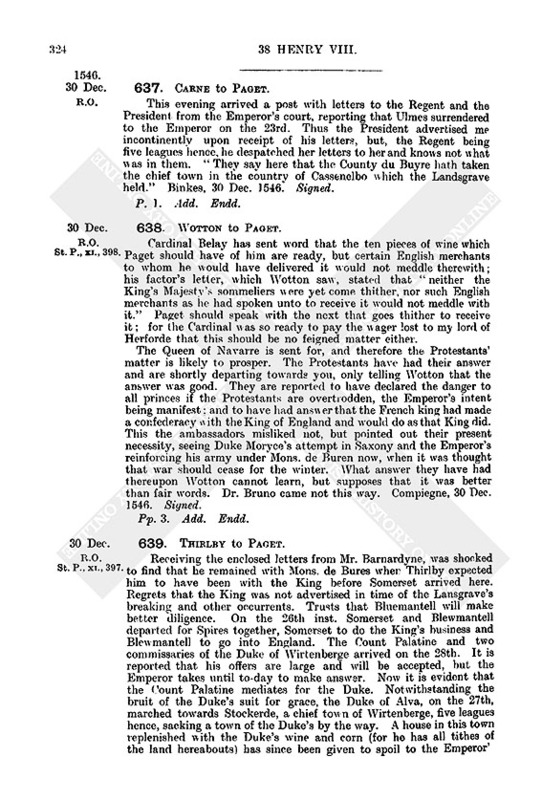 With regard to the third point they said that Baltasar Altieri, secretary to the English ambassador, presented letters of recommendation from some Protestant legates, and subsequently presented other letters from the Protestants at Ulm requesting the Signory to stop the passage through their territory to the Papal troops; and the proof that they disregarded these letters was that passage was allowed. Remembering the great benefits given him by Almighty God, and trusting that every Christian who dies in steadfast faith and endeavours, if he have leisure, to do such good deeds and charitable works as Scripture commands, is ordained, by Christ's Passion, to eternal life, Henry VIII. makes such a Will as he trusts shall be acceptable to God, Christ, and the whole company of Heaven, and satisfactory to all godly brethren in Earth. Repenting his old life, and resolved never to return to the like, he humbly bequeaths his soul to God, who in the person of His son redeemed it and for our better remembrance thereof "left here with us in his Church Militant the consecration and administration of his precious Body and Blood"; and he desires the Blessed Virgin and holy company of Heaven to pray for and with him, while he lives and in the time of his passing hence, that he may after this "the sooner attain everlasting life." For himself he would be content that his body should be buried in any place accustomed for Christian folks, but, for the reputation of the dignity to which he has been called, he directs that it shall be laid in the choir of his college of Windesour, midway between the stalls and the high altar, in a tomb now almost finished in which he will also have the bones of his wife, Queen Jane. And there an altar shall be furnished for the saying of daily masses while the world shall endure. The tombs of Henry VI. and Edward IV. are to be embellished. 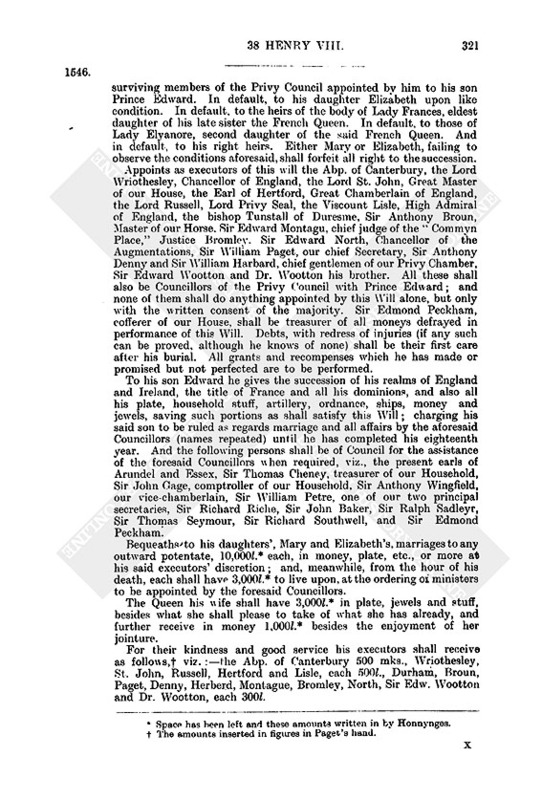 Upon his death, his executors shall, as soon as possible, cause the service for dead folk to be celebrated at the nearest suitable place, convey his body to Windsor to be buried with ceremonies (described), and distribute 1,000 mks. In alms to the poor "(common beggars, as much as may be, avoided)" with injunctions to pray for his soul. 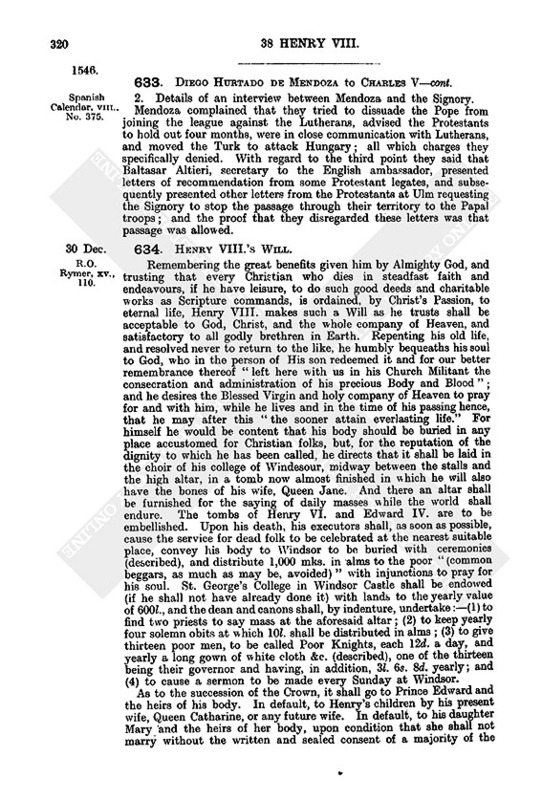 St. George's College in Windsor Castle shall be endowed (if he shall not have already done it) with lands to the yearly value of 600l., and the dean and canons shall, by indenture, undertake:—(1) to find two priests to say mass at the aforesaid altar; (2) to keep yearly four solemn obits at which 10l. shall be distributed in alms; (3) to give thirteen poor men, to be called Poor Knights, each 12d. a day, and yearly a long gown of white cloth &c. (described), one of the thirteen being their governor and having, in addition, 3l. 6s. 8d. yearly; and (4) to cause a sermon to be made every Sunday at Windsor. As to the succession of the Crown, it shall go to Prince Edward and the heirs of his body. In default, to Henry's children by his present wife, Queen Catharine, or any future wife. In default, to his daughter Mary and the heirs of her body, upon condition that she shall not marry without the written and sealed consent of a majority of the surviving members of the Privy Council appointed by him to his son Prince Edward. In default, to his daughter Elizabeth upon like condition. In default, to the heirs of the body of Lady Frances, eldest daughter of his late sister the French Queen. In default, to those of Lady Elyanore, second daughter of the said French Queen. And in default, to his right heirs. Either Mary or Elizabeth, failing to observe the conditions aforesaid, shall forfeit all right to the succession. Appoints as executors of this will the Abp. of Canterbury, the Lord Wriothesley, Chancellor of England, the Lord St. John, Great Master of our House, the Earl of Hertford, Great Chamberlain of England, the Lord Russell, Lord Privy Seal, the Viscount Lisle, High Admiral of England, the bishop Tunstall of Duresme, Sir Anthony Broun, Master of our Horse. Sir Edward Montagu, chief judge of the "Commyn Place," Justice Bromley. Sir Edward North, Chancellor of the Augmentations, Sir William Paget, our chief Secretary, Sir Anthony Denny and Sir William Harbard, chief gentlemen of our Privy Chamber, Sir Edward Wootton and Dr. Wootton his brother. All these shall also be Councillors of the Privy Council with Prince Edward; and none of them shall do anything appointed by this Will alone, but only with the written consent of the majority. Sir Edmond Peckham, cofferer of our House, shall be treasurer of all moneys defrayed in performance of this Will. Debts, with redress of injuries (if any such can be proved, although he knows of none) shall be their first care after his burial. All grants and recompenses which he has made or promised but not perfected are to be performed. Bequeaths to his daughters', Mary and Elizabeth's, marriages to any outward potentate, 10,000l. (fn. n3) each, in money, plate, etc., or more at his said executors' discretion; and, meanwhile, from the hour of his death, each shall have 3,000l. (fn. n3) to live upon, at the ordering of ministers to be appointed by the foresaid Councillors. Westminster Palace, 30 Dec. 1546, 38 Hen. VIII. Signed with the King's stamp (fn. n7) at beginning and end. Slightly mutilated, pp. 28. In William Honnynges' hand. Endd. as [to be] enrolled on the Close Roll of 1 (fn. n8) Edw. VI. The Royal Signed in red wax appended, injured. 576. f. 10. B. M.
2. Contemporary copy of the same, with the King's signature at the top and also at the end. 3. Another contemporary copy of the same. Large paper, pp. 17, written on one side only. Originally a roll. Pp. 16. At the end is the following memorandum in the. handwriting of Stowe the antiquary: "The originall of this Will under Seale is in Mr. Bradshawes handes of the Taylie office, whereby this coppie is examyned." Nevertheless the date at the end is read "the xiiich day of December." 6. A contemporary Italian translation of the same. "ex Regesto literarum Card. Poli" (Marini's Vatican Transcripts). 7. Copy in an Elizabethan hand. Pp. 25. Papers which follow in the same hand discuss the claims to the succession after Elizabeth's death which might be founded on this Will. Pp.16. Headed: "The testament and last Will of the most noble King," &c. A later hand has inserted "ffalse" before the word "last," and another has put a new heading in the margin: "Adulterina Voluntas Henrici 8," and has crushed in the preamble of an inspeximus by Edward VI. applying to the Will. 9. Exemplification of the enrolment of the above, dated Westm., 14 Feb. 1 Edw. VI. Parchment, two large membranes written on the one side only. Endd. in Lord Burghley's hand: 27 July, 1595. This was sent to me by ye Lord Cobham ffrom Mrs. Ashley, wiff to Sir Tho. Asshley. 10. 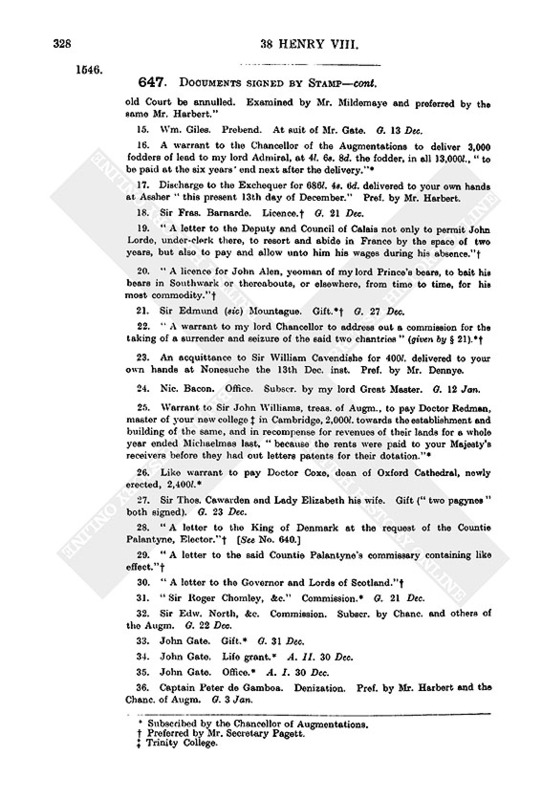 Draft of the legacy clause of Henry VIII's will, the wording being the same as in the final form of the will but the amounts (where given.) almost all much less, viz. :—Executors: abp. of Canterbury 500 mks., Wriothesley, Chancellor, 500l., St. John 200l., Russell 300l., Hertford 200l., Lisle 200l.. Durham 200l., Browne 300l., Pachet 200l., Denny 300l., Sir Wm. Harbert 200l., Sir Edw. Wottun 200l., Dr. Wottun 200l., Montagu 200l., Bramley 200l., North 200l. In Lisle's hand, pp. 4. 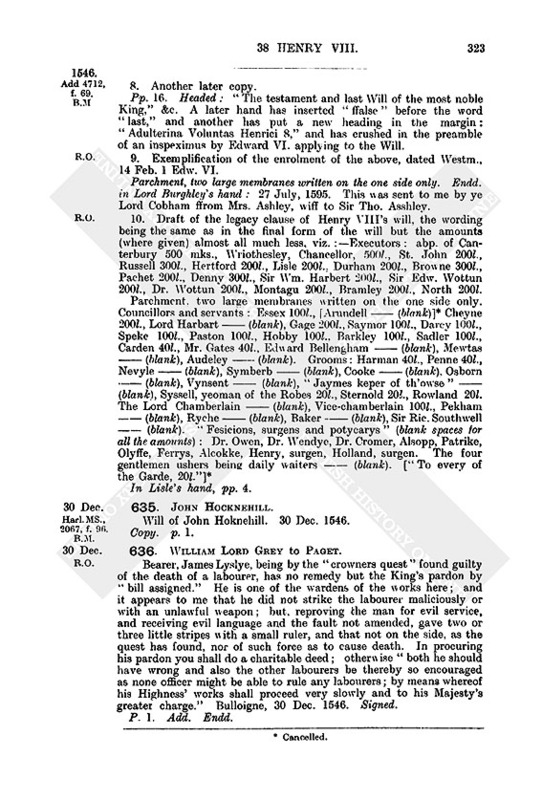 Will of John Hoknehill. 30 Dec. 1546. 636. William Lord Grey to Paget. 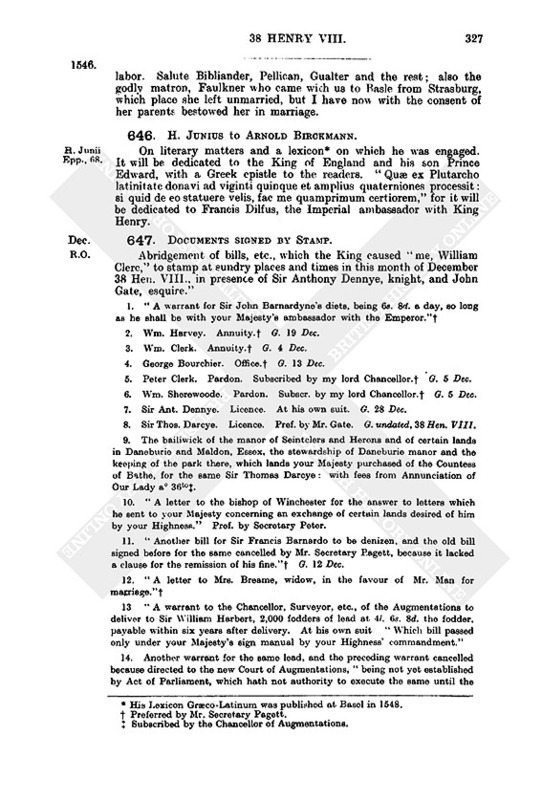 Bearer, James Lyslye, being by the "crowners quest" found guilty of the death of a labourer, has no remedy but the King's pardon by "bill assigned." He is one of the wardens of the works here; and it appears to me that he did not strike the labourer maliciously or with an unlawful weapon; but, reproving the man for evil service, and receiving evil language and the fault not amended, gave two or three little stripes with a small ruler, and that not on the side, as the quest has found, nor of such force as to cause death. In procuring his pardon you shall do a charitable deed; otherwise "both he should have wrong and also the other labourers be thereby so encouraged as none officer might be able to rule any labourers; by means whereof his Highness' works shall proceed very slowly and to his Majesty's greater charge." Bulloigne, 30 Dec. 1546. Signed. This evening arrived a post with letters to the Regent and the President from the Emperor's court, reporting that Ulmes surrendered to the Emperor on the 23rd. Thus the President advertised me incontinently upon receipt of his letters, but, the Regent being five leagues hence, he despatched her letters to her and knows not what was in them. "They say here that the County du Buyre hath taken the chief town in the country of Cassenelbo which the Landsgrave held." Binkes, 30 Dec. 1546. Signed. 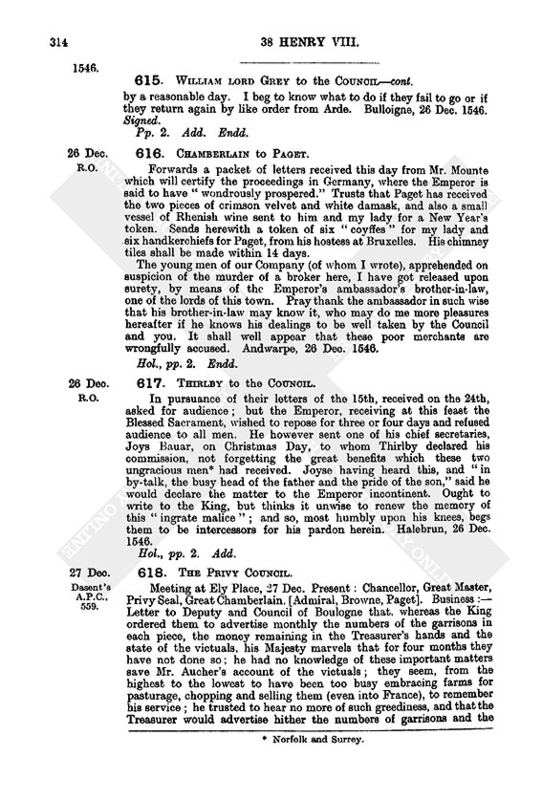 Cardinal Belay has sent word that the ten pieces of wine which Paget should have of him are ready, but certain English merchants to whom he would have delivered it would not meddle therewith; his factor's letter, which Wotton saw, stated that "neither the King's Majesty's sommeliers were yet come thither, nor such English merchants as he had spoken unto to receive it would not meddle with it." Paget should speak with the next that goes thither to receive it; for the Cardinal was so ready to pay the wager lost to my lord of Herforde that this should be no feigned matter either. The Queen of Navarre is sent for, and therefore the Protestants' matter is likely to prosper. The Protestants have had their answer and are shortly departing towards you, only telling Wotton that the answer was good. They are reported to have declared the danger to all princes if the Protestants are overtrodden, the Emperor's intent being manifest; and to have had answer that the French king had made a confederacy with the King of England and would do as that King did. This the ambassadors misliked not, but pointed out their present necessity, seeing Duke Moryce's attempt in Saxony and the Emperor's reinforcing his army under Mons. de Buren now, when it was thought that war should cease for the winter. What answer they have had thereupon Wotton cannot learn, but supposes that it was better than fair words. Dr. Bruno came not this way. Compiegne, 30 Dec. 1546. Signed. Receiving the enclosed letters from Mr. Barnardyne, was shocked to find that he remained with Mons. de Bures when Thirlby expected him to have been with the King before Somerset arrived here. 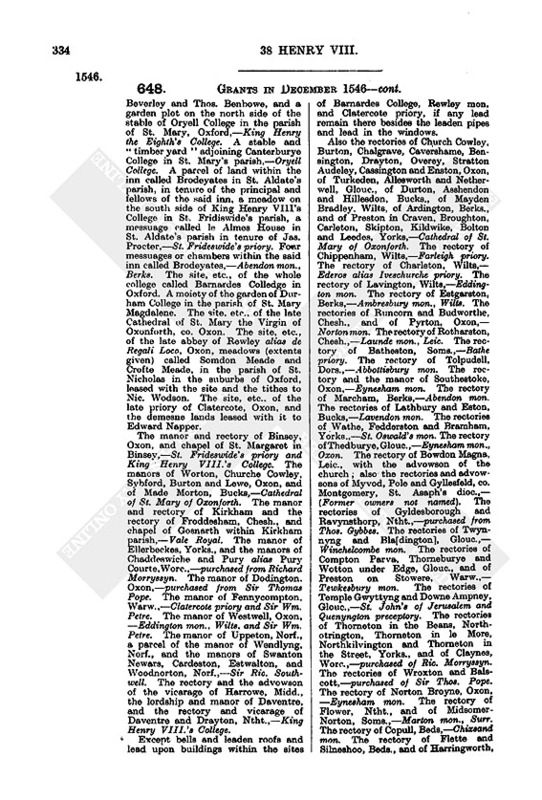 Regrets that the King was not advertised in time of the Lansgrave's breaking and other occurrents. Trusts that Bluemantell will make better diligence. On the 26th inst. Somerset and Blewmantell departed for Spires together, Somerset to do the King's business and Blewmantell to go into England. The Count Palatine and two commissaries of the Duke of Wirtenberge arrived on the 28th. It is reported that his offers are large and will be accepted, but the Emperor takes until to-day to make answer. Now it is evident that the Count Palatine mediates for the Duke. Notwithstanding the bruit of the Duke's suit for grace, the Duke of Alva, on the 27th, marched towards Stockerde, a chief town of Wirtenberge, five leagues hence, sacking a town of the Duke's by the way. A house in this town replenished with the Duke's wine and corn (for he has all tithes of the land hereabouts) has since been given to spoil to the Emperor' halberdiers. If the Emperor agree with the Duke we look to come to Spires or Wormes, or else to Frankeforde, the surrender of which to Mons. de Bures was reported yesterday. Halebrunne, 30 Dec. 1546. P.S.—Mors. de Deake promises to send these letters to Antwerpe and Thirlby has written to the governor there to forward them. He affirms that the French king will muster men at St. Nicholas in Loreyne. 2. Copy of the above from which it is printed in the Stato Papers See under date 10 Jan. 1547. 640. Henry VIII. to Christian III. Sends, at the request of the Count Palatine Frederick, Richard Morisin as his delegate to the conference to be hold in the City of Holstein ("Holsaciæ") in order to compose the differences between the Count and King Christian. Greenwich, 31 Dec. 1546. From the Archives of Denmark. Bill of "Alexaunder" asking allowance for Robert Gounbe from 1 May to 31 Dec. 38 Hen. VIII., viz., for his clothes and shoes and board for 35 weeks at 2s. 4d. a week. Total 6l. 9s. Signed by Sir Anthony Browne. William Grene's bill, headed Dec. 38 Hen. VIII., for making "a close stool for the use of the King's Majesty," which he delivered to Mr. Denne. The items include black velvet for covering it, 31b. of down for stuffing the seat, elbows and side pieces, 2,000 gilt garnishing nails, and 26 "bolyeon" nails at 6d. apiece. Total 4l. 10s. 6d. 2. Bill for silk fringe and ribbon supplied to Wm. Gren, coffer maker, 24 Nov. 38 Hen. VIII. for a "close stool for the King's Majesty." Total 27s.7½d. Signed (with a mark) as received by Elizabeth Slannyng, 11 Jan. 1 Edw. VI. Tabulated statement of the "whole charges due" 31 Dec. 38 Hen. VIII. to the garrison of Boulogne, viz.,:—Wages of captain, etc., of the fortress of Boulloigne Bargge, unpaid for sundry months before 8 Oct. last, 625l. Diets, wages, and entertainment of the Lord Deputy and Council of the town and marches of Boulloigne, and of captains, etc., in High Boulloigne, Baseboulloigne, the Old Man, the Young Man, and Boulloigne Bargge for the two months, 9 Oct. to 3 Dec, 8,048l. 18s. 9d. The like (numbers in each place given, total 3,705) for the month ending 31 Deci, 4,123l. 6s. 4d. Towards which remains in the hands of Sir Edward Dymoke, treasurer of the said town and marches, upon his account ended 8 Oct. last, l,670l. 19s. 2½d. So that there is yet wanting 11,126l. 5s. 10¾d. Large paper, p. 1. Endd. : 1546. Boulleyn garison payments. 644. [John] Burcher to Henry Bullinger. After so great a change in our prosperous condition, must report the evils impending over the Church in Germany. 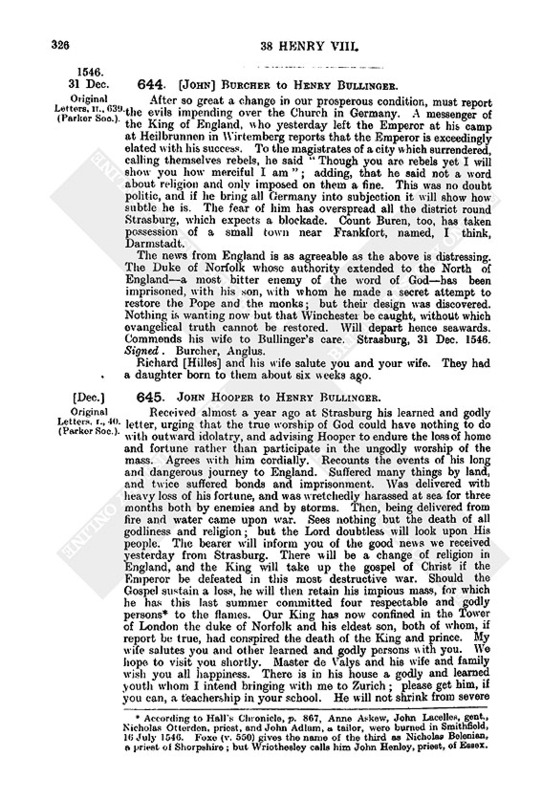 A messenger of the King of England, who yesterday left the Emperor at his camp at Heilbrunnen in Wirtemberg reports that the Emperor is exceedingly elated with his success. To the magistrates of a city which surrendered, calling themselves rebels, he said "Though you are rebels yet I will show you how merciful I am"; adding, that he said not a word about religion and only imposed on them a fine. This was no doubt politic, and if he bring all Germany into subjection it will show how subtle he is. The fear of him has overspread all the district round Strasburg, which expects a blockade. Count Buren, too, has taken possession of a small town near Frankfort, named, I think, Darmstadt. The news from England is as agreeable as the above is distressing. The Duke of Norfolk whose authority extended to the North of England—a most bitter enemy of the word of God—has been imprisoned, with his son, with whom he made a secret attempt to restore the Pope and the monks; but their design was discovered. Nothing is wanting now but that Winchester be caught, without which evangelical truth cannot be restored. Will depart hence seawards. Commends his wife to Bullinger's care. Strasburg, 31 Dec. 1546. Signed. Burcher, Anglus. Richard [Hilles] and his wife salute you and your wife. They had a daughter born to them about six weeks ago. 645. John Hooper to Henry Bullinger. Received almost a year ago at Strasburg his learned and godly letter, urging that the true worship of God could have nothing to do with outward idolatry, and advising Hooper to endure the loss of home and fortune rather than participate in the ungodly worship of the mass. Agrees with him cordially. Recounts the events of his long and dangerous journey to England. Suffered many things by land, and twice suffered bonds and imprisonment. Was delivered with heavy loss of his fortune, and was wretchedly harassed at sea for three months both by enemies and by storms. Then, being delivered from fire and water came upon war. Sees nothing but the death of all godliness and religion; but the Lord doubtless will look upon His people. The bearer will inform you of the good news we received yesterday from Strasburg. There will be a change of religion in England, and the King will take up the gospel of Christ if the Emperor be defeated in this most destructive war. Should the Gospel sustain a loss, he will then retain his impious mass, for which he has this last summer committed four respectable and godly persons (fn. n10) to the flames. Our King has now confined in the Tower of London the duke of Norfolk and his eldest son, both of whom, if report be true, had conspired the death of the King and prince. My wife salutes you and other learned and godly persons with you. We hope to visit you shortly. Master de Valys and his wife and family wish you all happiness. There is in his house a godly and learned youth whom I intend bringing with me to Zurich; please get him, if you can, a teachership in your school. He will not shrink from severe labor. Salute Bibliander, Pellican, Gualter and the rest; also the godly matron, Faulkner who came with us to Basle from Strasburg, which place she left unmarried, but I have now with the consent of her parents bestowed her in marriage. 646. H. Junius to Arnold Birckmann. On literary matters and a lexicon (fn. n11) on which he was engaged. It will be dedicated to the King of England and his son Prince Edward, with a Greek epistle to the readers. "Quæ ex Plutarcho latinitate donavi ad viginti quinque et amplius quaterniones processit: si quid de eo statuere velis, fac me quamprimum certiorem," for it will be dedicated to Francis Dilfus, the Imperial ambassador with King Henry. 647. Documents signed by Stamp. Abridgement of bills, etc., which the King caused "me, William Clerc," to stamp at sundry places and times in this month of December 38 Hen. VIII., in presence of Sir Anthony Dennye, knight, and John Gate, esquire." 2. Wm. Harvey. Annuity, (fn. n12)G. 19 Dec.
3. Wm. Clerk. Annuity, (fn. n12)G. 4 Dec.
4. George Bourchier. Office, (fn. n12)G. 13 Dec.
5. Peter Clerk. Pardon. Subscribed by my lord Chancellor. (fn. n12)G. 5 Dec.
6. Wm, Sherewoode. Pardon. Subscr. by my lord Chancellor, (fn. n12)G. 5 Dec.
7. Sir Ant. Dennye. Licence. At his own suit. G. 28 Dec.
8. Sir Thos. Darcye. Licence. Pref. by Mr. Gate. G. undated, 38 Hen. VIII. 10. "A letter to the bishop of Winchester for the answer to letters which he sent to your Majesty concerning an exchange of certain lands desired of him by your Highness." Pref. by Secretary Peter. 11. "Another bill for Sir Francis Barnardo to be denizen, and the old bill signed before for the same cancelled by Mr. Secretary Pagett, because it lacked a clause for the remission of his fine." (fn. n12)G. 12 Dec.
13 "A warrant to the Chancellor, Surveyor, etc., of the Augmentations to deliver to Sir William Harbert, 2,000 fodders of lead at 4l. 6s. 8d. the fodder, payable within six years after delivery. At his own suit "Which bill passed only under your Majesty's sign manual by your Highness' commandment." 14. Another warrant for the same lead, and the preceding warrant cancelled because directed to the new Court of Augmentations, "being not yet established by Act of Parliament, which hath not authority to execute the same until the old Court be annulled. Examined by Mr. Mildemaye and preferred by the same Mr. Harbert." 15. Wm. Giles. Prebend. At suit of Mr. Gate. G. 13 Dec.
17. Discharge to the Exchequer for 686l 4s. 6d. delivered to your own hands at Aseher "this present 13th day of December." Pref. by Mr. Harbert. 18. Sir Fras. Barnarde. Licence, (fn. n15)G. 21 Dec.
21. Sir Edmund (sic) Mountague. Gift. (fn. n14) (fn. n15)G. 27 Dec.
23. An acquittance to Sir William Cavendishe for 400l. delivered to your own hands at Nonesuche the 13th Dec. inst. Pref. by Mr. Dennye. 24. Nic. Bacon. Office. Subscr. by my lord Great Master. G. 12 Jan.
27. Sir Thos. Cawarden and Lady Elizabeth his wife. Gift ("two pagynes" both signed). G. 23 Dec.
31. "Sir Roger Chomley, &c." Commission. (fn. n14)G. 21 Dec.
32. Sir Edw. North, &c. Commission. Subscr. by Chanc. and others of the Augm. G. 22 Dec.
33. John Gate. Gift. (fn. n14)G. 31 Dec.
34. John Gate. Life grant. (fn. n14)A. II. 30 Dec.
35. John Gate. Office. (fn. n14)A. I. 30 Dec.
36. Captain Peter de Gamboa. Denization. Pref. by Mr. Harbert and the Chanc. of Augm. G. 3 Jan.
37. Sir Edw. North. Office. (fn. n17) A. i.2 Jan.
38. Sir Thos. Moyle. Office. (fn. n17) A. i. 2 Jan.
39. Walter Mildemaye. Office. (fn. n17) A. i. 2 Jan.
40. Sir John Williams. Office. (fn. n17) A. i. 2 Jan.
41. Ric. Goodrick. Office. (fn. n17) A. i. 2 Jan.
42. John Gosnolde. Office. (fn. n17) A. i. 2 Jan.
43. Sir Thos. Pope. Office. (fn. n17) A. i. 2 Jan.
44. Robt. Henneage. Office. (fn. n17) A. i. 2 Jan.
45. Geoff. Gate. Office. (fn. n17) A. i. 2 Jan.
46. John Arscott. Office. (fn. n17) A. i. 2 Jan.
47. Ric. Duke. Office. (fn. n17) A. i. 2 Jan.
48. Wm. Stamforde. Annuity. (fn. n17) A. ii. 2 Jan.
49. Sir Ant. Browne and Lady Elizabeth his wife. Gift. (fn. n18)G. 1 Jan.
52. Wm. Layton. Annuity. (fn. n18) A. ii. 10 Jan.
54. John Richebell. Gift. (fn. n18)G. 22 Jan.
55. Edw. Bellingeham. Gift. (fn. n18)G. 7 Jan.
56. Edw. Bellingeham. Office. (fn. n18) A. i. 4 Jan.
57. Anthony Browne to be "joyntpatent" with his father in the office of standard-bearer. Pref. by Sir Ant. Browne. G. 1 Jan.
60. Sir Wm. Parr earl of Essex. Gift. (fn. n18)G. 11 Jan.
61. Dr. Crome and Alice his wife. Gift. (fn. n18)G. 4 Jan.
64. Acquittance to Sir Edm. Peckham, high treasurer of the Mints, for 2.000l. delivered to your own hands at Otelandes, the 11th Dec. inst. Pref. by Mr. Dennye. Parchment roll of 3. Membranes signed at the end: W. Clerc. 648. Grants in December 1546. 1. Ambrose Dudley and Anne his wife. Livery of lands in right of the said Anne as one of the two daughters and coheirs of William Whorwood, dec. Del. Westm., 1 Dec. 38 Hen. VIII.— S.B. (very much mutilated). Pat. p. 4, m. 56. 2. Thomas Chatwyn. Warrant for livery of lands to him (being aged 38 years and more) as s. and h. of William Chatwyn, who died, 10 April 37 Hen. VIII., seised of the manors of Ingestre and Grotwiche, with lands there and in Mutton and Rule, worth 37l. yearly, and one knight's fee in Salte holden of the King by knight service as of the barony of Stafford, and lands in Stafford holden in free burgage worth 29s. 8d. yearly. Dated 25 Nov. 38 Hen. VIII. Del. Westm., 1 Dec— S.B. (signed by St. John, Hynde, Goodrick and Beamount). 3. George Horsey and Mary his wife, George Burgon and Dorothy his wife, Anne Perycut (sic) and Elizabeth Peryent. Livery of lands in right of the said Mary, Dorothy, Anne and Elizabeth, daughters and coheirs of Anne Warner, late wife of Robert Warner, dec., and previously wife of Thomas Peryent. Del. Westm., 2 Dec. 38 Hen. VIII.—S.B. (signed by St. John, Hynde and Goodrick). Pat. p. 8, m. 11. 4. Maurice Walshe. Livery of lands as s. and h. of Sir John Walshe, dec Del. Westm., 2 Dec. 38 Hen. VIII.— S.B. (signed by St. John, Hynde, Goodrick and Beamount). Pat. p. 8, m. 17. 5. Robert Sergier. To be bailiff and collector of the hundred of Whytley, and of the manors of Weston, Myddelsowy, Othery, Greyngton, Shapwyk, Asshecote, Walton and Strete, Soms., which belonged to Glastonbury mon. ; as amply as enjoyed by Thomas Wortham or any other. Oteland, 20 Nov. 38 Hen. VIII. Del. Westm., 2 Dec.—P.S. Pat. p. 12, m. 3. 6. Thomas Robertes, clk. Fiat for livery of lands in the city of Gloucester to him as s. and h. of Thomas Robertes, dec., who held of the King lands in Normore, Culver Bridge, Furlonge and Trydworth worth 33s. 4d. yearly, and of others in socage lands in Chursdyn parish called Parton Noke and Wudhokelcote, and lands in Newlond near the city of Gloucester, worth 52s. 3d. yearly. Dated 11 Nov. 38 Hen. VIII. Del. Westm., 2 Dec. (signed by St. John, Hynde, Goodrick and Beamount). 7. Cuthbert Best, late of Gaynforde, Dham. Pardon for the slaughter of John Wrangam, whom he struck on the head with a stick on 24 Jan. 37 Hen. VIII., causing a wound from which Wrangam died two days later. Del., Westm., 3 Dec. 38 Hen. VIII.— S.B. Pat. p. 3, m. 45. 8. Thomas Chaloner, the King's servant. Custody, during fits of insanity, of the body and goods of John Canon, merchant tailor of London, who, by inquisition taken at the Guildhall, 29 Sept. last past, was found to be insane but with lucid intervals. Del. Westm., 3 Dec. 38 Hen. VIII.— S.B. (countersigned by St. John). Pat. p. 3, m. 48. 9. William Clerk, the King's servant. Annuity of 30l, payable from Michaelmas 37 Hen. VIII. Otelandes, 1 Dec. 38 Hen. VIII. Del. Westm., 4 Dec. 38 Hen. VIII—P.S. Pat. p. 3, m. 48. 10. John Norres, of Bray, Berks. Grant, in fee (for a messuage and lands, specified, in tenure of Chr. Avelen in New and Old Wyndesore, Berks, and 10 ac. of land in tenure of John Vachell between Poundelane and Asshrydge Wood in Hurste parish, Wilts, and for 52l. 6s. 8d. ), of the chief mansion and site of the late priory of Wallyngforde, Berks, the site and chief messuage of the manor of Wallyngforde, the demesne lands (named) of the said priory, now in tenure of John Purdon, certain closes (specified) in Wallingforde, also in Purdon's tenure (some of them formerly of Ric. Forde), the woods called Priors Wooddes (11 ac. 3 ro.) in the parish of Sonkom and Ewelme, Oxon, — Wallingford priory and Thomas Wolcey, late cardinal. Del. Westm., 4 Dec. 38 Hen. VIII.— S.B. (signed by Gardiner, St. John, Russell, North, Sir Thos. Pope, Bacon and Duke). Pat. p. 4, m. 23. (1) Pat. 21 March 31 Hen. VIII, to Sir John Horsey of the mansion called Longleyte, Wilts, with lands in Deverall Longe Bridge, Longleyte, Hornyngesham, Maydenbradleigh, and Hill Deverell parishes, Wilts,—Henton priory Soms. ; at 6s. rent. Which property now belongs to John Thynne, of Longlete. (2) Pat. 8 April 32 Hen.VIII, to Edward earl of Hertford, of all lands in Lullyngton, Bekyngton, Longlete, Offorde, Warmyster, Codeforde, Deverell Longbridge, Hill Deverell, Hornyngesham, Stourton, Upton Noble, Nonney, Frome, Selwoode, Wooforde, Wolverton and Buckland, Soms., which belonged to the priory or cell of Longlete and Charterhouse of Hynton, Soms., and the rectory and the advowson of the vicarage of Lullyngton, — Longlete priory and Hynton Charterhouse; at rents of 34s. 8d. and 5l. Which property now belongs to the said John Thynne. (3) Pat. 27 July 34 Hen. VIII., to Edward earl of Hertford, of the manor of More Abbesse and More Malwyn, Hants,—Romsey; at 46s. rent. (4) Pat. 14 Aug. 36 Hen. VIII., to Wm. 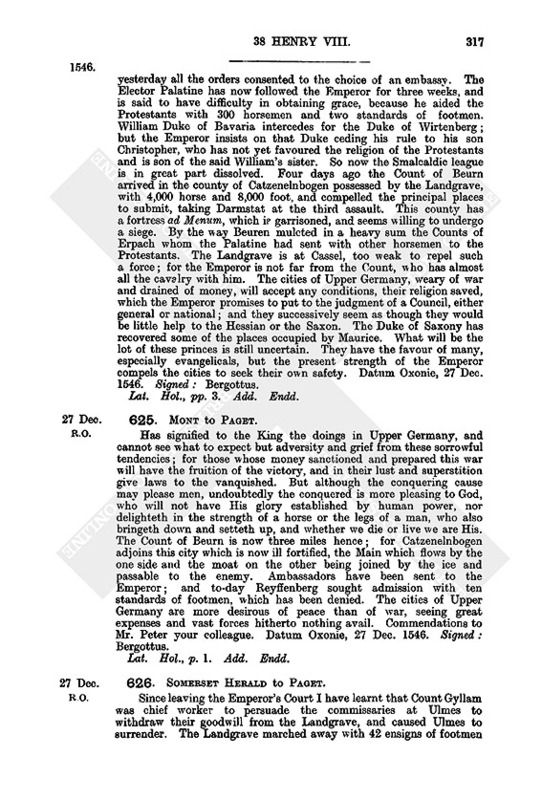 Rygges and Leonard Browne, of lands in Westhroppe and Southover within the parish of Tollepuddell, Dors.,—Abbottesbury; and the manor and advowson of the rectory of Burdeleston alias Burceston alias Burston, Dors., and lands in Burdeleston, Little Puddell alias Thropp and Wodesforde,—Mylton; at rents of 5s. 8d. for the lands of Abbottesbury and 15s. for those of Mylton. (5) Pat. 8 Sept. 36 Hen.VIII., to Thos. Strowde, Walter Erle and Jas. 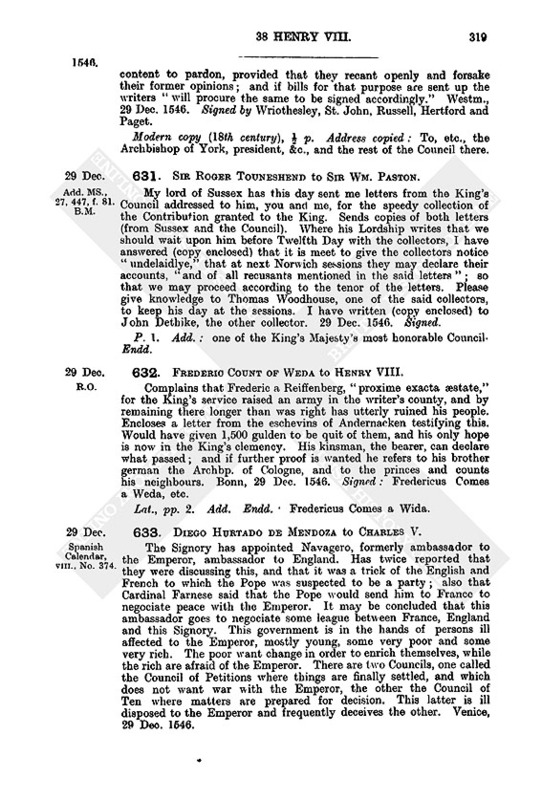 Pagett, of lands in Bardolfeston within the parish of Puddell Towne, Dors.,—Romsey; at 4s. rent. (6) Pat. 17 June 34 Hen. VIII., to Ric. Andrewes of Hayles, Glouc, and Leonard Chamberleyn of Woddestoke, Oxon, of the chief messuage and site of the manor of Langley, Soms., and lands leased with it, and the chapel of St. Algar in Langley,—Cirencester mon., Glow. ; at 8s. 8d. rent. Also grant, in fee, of the manor, and advowson of the rectory, of Wirdesforde alias Wodesforde, Dors.— Cerne. Del. Westm., 4 Dec. 38 Hen. VIII. — S.B. (mutilated, signed by Russell, Browne, St. John, and others whose names are lost). Pat. p. 7, m. 22. 12. William Sherwode, late of Coldaiston, Glouc, clk., S.T.B., rector of the parish churches of Coldaiston, Glouc, and Weston-super-Mare, Soms. General pardon of treasons, &c, committed before this date. Del. Westm., 5 Dec. 38 Hen. VIII.—S.B. (countersigned by Wriothesley). Pat. p. 3, m. 50. 13. Peter de Clerke, late of London, yeoman alias Frenchman. Pardon for the murder of John Eves alias Coke, whom, on 28 Aug. last, at Ratclyff, Midd., he killed with a sword, by a certain stroke called "a foyne." Del. Westm., 5 Dec. 38 Hen. VIII.—S.B. (countersigned by Wriothesley). Pat. p. 5, m. 34. 14. Sir John Russell lord Russell, keeper of the Privy Seal, the King's Councillor, and Francis Russell, esq., the King's servant, son of the said Lord Russell. Grant of the next advowson of the rectory of Marshe, Bucks. Otelande, 30 Nov. 38 Hen. VIII. Del. Westm., 5 Dec—P.S. Pat. p. 5, m. 42. 15. David Pyrrye, a groom of the Chamber. To be keeper of the castle or chief gaol within Canterbury, vice Nicholas Coke, dec. Otelande, 30 Nov. 38 Hen. VIII Del. Westm., 6 Dec. —P.S. Pat. p. 5, m. 36. 16. Patrick Raynolde. To be the King's apothecary; with 40 mks, yearly, payable from Michaelmas last. Otelande, 30 Nov. 38 Hen. VIII Del. Westm., 6 Dec.—P.S. Pat. p. 5, m. 36. 17. Sir Thomas Wharton lord Wharton. Grant, in fee, for his services and for 935l. 16s. 8d., of the reversion of the manor and rectory of Ravenstondale, Westmld., which by pat. 16 July 32 Hen. VIII, is held by Robert abp. of York for life; and grant of the said lordship and manor and rectory, the advowson of the vicarage of Ravenstondale, and numerous messuages and lands (extents given) in tenure of Edw. Milner, John Todde, Robt. Shawe, Geo. Fawcett, Wm. Fawcett, Cuthb. Hunte, Miles Futhergill, Hugh Shawe, Rog. Shawe, Edm. Shawe, Lancelot Shawe, Marg. Shawe, Robt. Futhergill, Jenkin Futhergill, Jas. Paycoke, Roland Paycoke, Chr. Wharton, Thos. Grene, Leonard Greyn, Miles Garthwaite, Wm. Peycoke, Thos. Sawer, Hen. Handeley, Reg. Fawcett, Hugh Handeley, John Grene, Geo. Grene, Chr. Grene, Roland Dent, Jas. Dent, Chr. Wharton, Ric. Halle, Robt. Halle, Ric. Nelson, Roland Dent, Geoff. Hablethwaite, Steph. Fawcett, Gilb. Fawcett, Geoff. Fawcett, Robt. Fawcett, Chr. Fawcett's widow, Jenkin Fawcett, Edw. Fawcett, John Hablethwaite, Wm. Hablethwaite, Reginald Goldington, Wm. Alatson, Jas. Fawcett, Thos. Goldington, Chr. Goldington, John Person, Reg. Adamthwaite, Robt. Adamthwaite, Martin Futhergill, Miles Futhergill, Ric. Adamthwaite, Edw. Adamthwaite's widow, Rob. Adamthwaite's widow, Geo. Futhergill, John Futhergill, Reg. Futhergill's widow, Nic. Futhergill, Jas. Futhergill, Gilbert Blerthorne, Thos. Swynebanke's widow and Rol. Swynebanke, Cuthb. Swynebanke, John Perkyn, Ric. Coke, Giles Coke, Reg. Swynebanke, Robt. Todde, Gilbert Perken, Thos. Heblethwaite, Rol. Perken, Ant. Grene, Lancelot Bayliff, Cuthb Synebanke (sic), clk., Thos. Pynder, Geoff. Futhergill, Rol. Futhergall's widow, John Nycholson, Wm. Shawe, John Paycoke, clk., Wm. Baylyff, Ric. Fawcett, Simon Taylour, Giles Fawcett's widow, Rol. Wilson, Wm, Heblethwaite, Cuthb. Swynebanke, clk., John Todde, Lancelot Grene, Abraham Taylour, Rol. Taylour, Rog. Grene, Ric. Grene, Thos. Fawcett, Chr. Wharton, John Wharton, John Halle, Steph. Boussell, Jas. Bell, Reg. Boussell, John Hanley, Chr. Todde, Lancelot Pynder, Cuthb. Goldington, Matth. Dent, Geo. Dent, Wm. Dent, John Boussall, Hen. Boussell, Chr. Bell, Geoff. Dent, Geo. Dent, Rol. Bell, Wm. Peyreses, Ric. Bouselde, John Pynder, Leonard Peyres, Rog. Shawe, Adam Shawe, Edw. Fawcett's widow, Cuthb. Fawcett, Marg. Fawcett, Vincent Taylour's widow, Ric. Robynson, Wm. Myrthwait, Rol. Mirthwaite, John Cantley, John Cantley's widow, John Lovell's widow, Lancelot Myrthwaite, Lancelot Dent, Ric. Dent, Wm. Robynson, Thos. Robynson, Rog. Corney, Ric. Walker, Rol. Holme, Edw. Pynder, Simon Pynder, Arth. Fawcell alias Fawcett, Ric. Canteley, Wm. Richardson, Wm. Robynson's widow, Hen. Bovell, Nic. Clement, Jas. Hablethwaite, Rol. Futhergill, Ant. Futhergill, Hen. Futhergill, Geo. Peycoke, Ric. Halle, Oswald Futhergill, John Perkyn, Alice Rudde, John Blankerne, John Taylour, Wm. Pettey, Edw. Robynson, Ric. Granger, Thos. Robertson, John Skayff, John Whitehedde's widow, Thos. Whitehedde, Ric. Perke, Robt. Holme, Robt. Thornebrughe, John Perke, Hen. Holme, Thos. Wharton's widow, Robt. Perke's widow, Alex. Vilsen, Wm. Warde, Wm. Duckett, Cuthb. Thorneboroughe's widow, Rol. Fawcett and Jas. Inman, the little closes called "Intackes" in tenure of Robt. Thorneboroughe, Ric. Perke, Robt. Holme and Thos. Whitehedde, pastures called le Olde Parke and Vyncent Parke in tenure of Lord Wharton and Sir Thomas Wharton, his son, pasture called Westerdale in tenure of Lord Wharton, and messuages, etc., in tenure of Wm., Thos., and Leonard Chamberleyne, all which premises lie in Ravenstondale,Westmld. —Walton priory, Yorks. A cottage in tenure of John Thompson's widow in Kyrkebye Stephan, Westmld., rent of 8s. and service from lands of Lord Dacre in Ravenstondale, Westmld., 3s. and service from lands of Robt. Thorneboroughe's widow there, and 2s. 8d. and service from lands of John Sparke there—Watton. Del. Westm., 6 Dec. 38 Hen. VIII.—S.B. (slightly mutilated, signatures lost). Pat. p. 7, m. 19. 18. Laurence Barry. 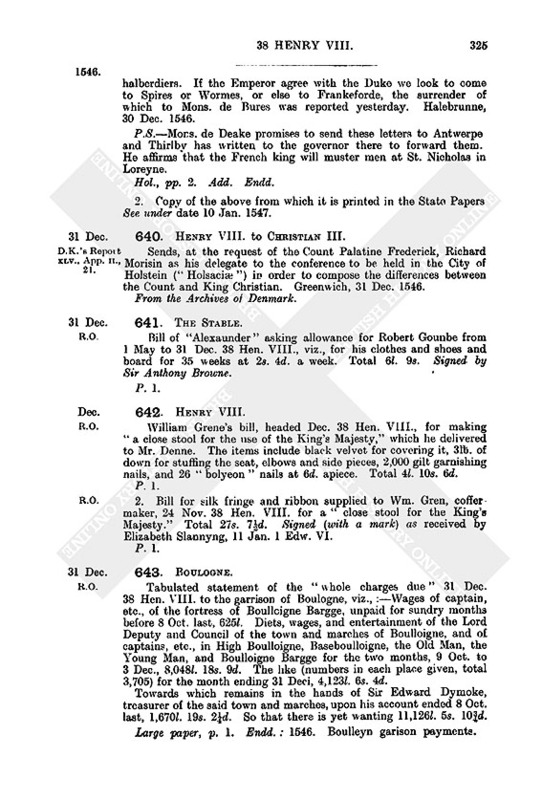 Livery of lands as s. and h. of John Barry, dec Del. Westm., 6 Dec. 38 Hen. VIII.— S.B. (signed by St. John, Hynde and Beamount). Pat. p. 7, m. 42. 19. James Granado, the King's servant. Annuity of 50l., payable from Michaelmas last. Otelande, 30 Nov. 38 Hen. VIII. Del. Westm., 7 Dec.— P.S. Pat. p. 5, m. 35. 20. Henry Knowles, the King's servant. Annuity of 50l., payable from Michaelmas last. Otelande, 30 Nov. 38 Hen. VIII. Del. Westm., 7 Dec—P.S. Pat. p. 5, m. 35. 21. James Wilfford, the King's servant. Annuity of 50l., payable from Michaelmas last. Otelande, 30 Nov. 38 Hen. VIII. Del. Westm., 7 Dec.—P.S. Pat. p. 5, m. 36. 22. Robert Brokilsbye & Nicholas Girlyngton. Grant, in fee, for 1,085l. 12s. 10½d., of rents and service from lands in Upton, Linc., of Ric. Wilkynson (13d. ), John Wylkynson (2s. 4d. ), John Lowson (20d. ), Edw. Darwyn (10d. ), Robt. Watkynson (15½d.) and Jas. Wylkynson (15½d. ), a piece of land in Upton called Hemplande, in tenure of John Jackson, rent of 4s. and service from lands of Ric. Bellynyam alias Belyngeham in Upton, three messuages, etc., in tenure of John Thorgas, Thos. Toynton and Rog. Wilkynson in Upton, rent of 1d. and service from one selion of land of Robt. Topplett in Upton, the grove called Upton Grove (4 ac.) in Upton and all other possessions there of Willoughton preceptory and St. John's of Jerusalem. The rectory and the advowson of the vicarage of Burton Stather, Linc.,— Norton mon., Chesh. Lands in tenure of Peter Stowe, Ric. Stowe, Robt. Lincoln, Wm. Woodde and Wm. Weste in Newton juxta Trente, Notts, and all other lands there of St. Katharine's priory next the walls of Lincoln. A messuage and lands in tenure of Thos. Hernes in Normanbye, Linc., and all other lands there of Goikewell priory. Lands in tenure of John Kyrkeby, John Cadney, Thos. Stodderd, Rog. Pottes, Hen. Pate, and Wm. Wygan in the town of Wadyngham, Linc., and all other lands in that town of the cell of St. Leonard next Stampforde and Durham mon. Lands in tenure of Thos. Hollyngworth, John Welle, John Pettes, the relict of Ric. Hacheman, and Thos. Phelipson in Epworth, Linc., a toft in tenure of John Mave in Haxsey parish, Linc., lands in tenure of Peter Clerke in Belton parish, Linc., and lands in tenure of Thos. Farre in Haxsey parish,—Axholme Charterhouse. Pasture (1½ ac.) in tenure of Hamo Sutton in Canweyk, Linc.,—Swyneshed abbey. Lands in tenure of Thos. Cake and John Speke in Retforthe and Moreton, Notts,—Mattersey priory. The manor, the rectory and advowson of the vicarage of Pychelesthorne, Bucks and Herts,—Assherudge college. Two messuages, etc., in tenure of Nic. Sutton and two in tenure of Wm. Hynde and Robt. Richardson in Willoughton, Linc.—Willoughton preceptory and St. John's of Jerusalem. The chief messuage and grange of Kyrnyngton in Kyrnyngton (or Kyrmyngton) parish, Linc., and all lands leased with it to George Hopkynson,—Newsome mon. A meadow called Orwell Meade (5 ac.) and lands in tenure of Robt. Samwell in Clyfton, Beds., lands there in tenure of Wm. Tylcocke and Alice Nele, these lands in Clyfton being leased to Sir Mich. Fyssher,—Warden mon. Messuages and lands in tenure of John Gambull in Skrekyngton, Linc., and of Chr. Hall in Helperyngham, Linc., Semperyngham mon. A garden and 3 roods of land in tenure of Geo. Nicholles in Ivechurche in St. Paul's parish without Canterbury,—St. Augustine's, Canterbury. The mill called Fludmyll, in tenure of Robt. Joce in Feversham parish, Kent, with all its appurtenances except the parcel of land in Feversham in tenure of John Elfrythe, —Feversham mon. The manor of Pappeworth Annyes, Hunts and Camb., and the site and chief messuage and lands of the same in tenure of John Blackman, a messuage, etc., there, in tenure of Roland Lynne (lying with a tenement of Ant. Mallery on either side, the highway on the east and Graveley Field on the west), other lands (specified) there, in tenure of Roland Lynne. John Olyver and John Ederson,—Huntyngdon priory. The messuage called Priour Garth and lands in tenure of Thos. Kyrkeshey in Roxebye, Linc.,—Draxe priory. The croft next the grange of the late prior of Semperyngham in Cranwell, Linc., and lands in tenure of Wm. Clerke, and a toft, &c., late in tenure of Adam Pytloke and now of Wm. Pereson in Crane well,—Temple Brewer preceptory and St. John's of Jerusalem. A windmill called Willoughton Wyndemyll in tenure of John Sutton in Willoughton, Linc.,—Willoughton preceptor and St. John's of Jerusalem. Meadows and fishery (specified) in tenure of Hen. Cowper in Southcharforde, Hants, and a pasture for 60 sheep upon Southcharford Downe in tenure of Peter Trepock, and all other lands in Southcharforde of the priory of Bremmer. The manor of Trente, Soms., the site and chief messuage and lands (names and extents given) of the same in tenure of John Harm am, gent., messuages, etc. (specified) in Trente in tenure of Thos. Newman, John Browne, John Bowle and Isabella his wife, Alice Laurence, Rie Frauncys, John Smyth, John Dyrdroo, sen., and Joan Garmawey, and the wood called Trente Wodde (7½ ac),—Studley priory, Warw. Del. Westm., 7 Dec. 38 Hen. VIII.—S.B. (mutilated, signed by Russell, Browne, Riche, North, Sir Ric Southwell, Duke and Chydley). Pat. p. 6, m. 28. 23. Margaret Derikson of the parish of Marke in the marches of Calais. Licence for life to brew beer. Otelande, 8 Dec. 38 Hen. VIII. Del. Westm., 8 Dee— P.S. Pat. p. 8, m. 18. 24. City of Lincoln. Grant to the mayor, sheriffs, citizens and commonalty, for the alleviation of their fee farm and other burdens, and in consideration of 135l. 14s. 3½d. paid by them, of the advowsons of the rectories of Hanslape, Bucks, and of Hemyswell, Surflete and Belton, Linc. ; also the said rectories. Also appropriation to the said mayor, &c., of the said churches, the present rectors of which are, of Hanslape Robt. Bone, of Hemyswell Rog. Norton, of Surflete Wm. 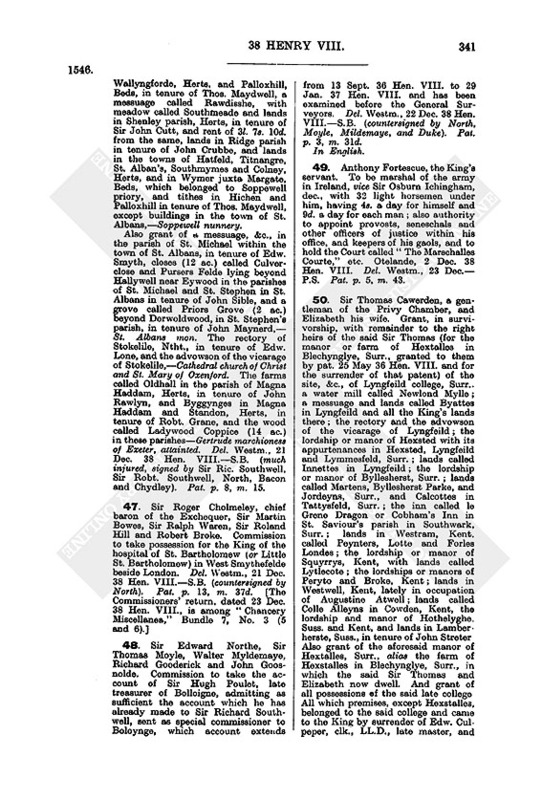 Clyfton, and of Belton John Pope; and licence, upon the termination of the incumbency of these rectors, to convert the said rectories and churches to the use of the said mayor, etc., substitute perpetual vicarages and assign suitable portions for the support of the vicars (status and provision to be made for each defined) whose stipends shall be, Hanslape 14l. 13s. 4d., Hemyswell 11l., Surflete 11l. and Belton 11l. ; also mortmain licence to endow the said vicars as above; and grant of the advowsons of the said vicarages. Del. Westm., 11 Dec. 38 Hen. VIII.—S.B. (very mutilated and worn). Pat. p. 4, m. 53. 25. Cathedral of Christ, Oxford, of the King's foundation. Grant, to the dean and chapter, of the sites, etc., of the former priory of St. Fridiswide and late college called King Henry the Eightes Colledge, of the college called Canterburye Colledge, of the hall called Vinehall alias Pekwaters Inne, and of the hall called Edwardes Hall, within the city of Oxford. The brewhouse in Oxford, now overthrown, lately in tenure of Wm. 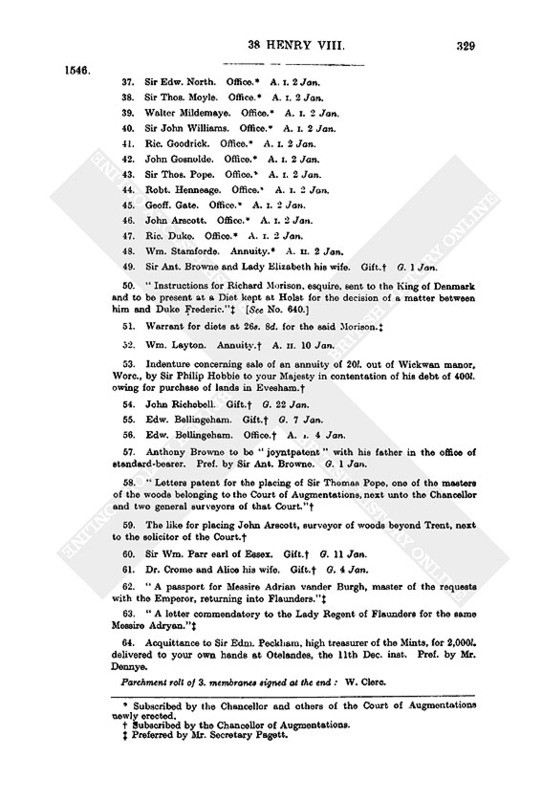 Fryer, messuages in St. Aldate's parish, Oxford, in tenure of Ric. Beverley and Thos. Benbowe, and a garden plot on the north side of the stable of Oryell College in the parish of St. Mary, Oxford,—King Henry the Eighth's College. A stable and "timber yard" adjoining Canterburye College in St. Mary's parish,—Oryell College. A parcel of land within the inn called Brodeyates in St. Aldate's parish, in tenure of the principal and fellows of the said inn, a meadow on the south side of King Henry VIII's College in St. Fridiswide's parish, a messuage called le Almes House in St. Aldate's parish in tenure of Jas. Procter,—St. Frideswide's priory. Four messuages or chambers within the said inn called Brodeyates,—Abendon mon., Berks. The site, etc., of the whole college called Barnardes Colledge in Oxford. A moiety of the garden of Durham College in the parish of St. Mary Magdalene. The site, etc., of the late Cathedral of St. Mary the Virgin of Oxonforth, co. Oxon. The site, etc., of the late abbey of Rewley alias de Regali Loco, Oxon, meadows (extents given) called Somdon Meade and Crofte Meade, in the parish of St. Nicholas in the suburbs of Oxford, leased with the site and the tithes to Nic. Wodson. The site, etc., of the late priory of Clatercote, Oxon, and the demesne lands leased with it to Edward Napper. The manor and rectory of Binsey, Oxon, and chapel of St. Margaret in Binsey,—St. Frideswide's priory and King Henry VIII. 's College. The manors of Worton, Churche Cowley, Sybford, Burton and Lewe, Oxon, and of Made Morton, Bucks,—Cathedral of St. Mary of Oxonforth. The manor and rectory of Kirkham and the rectory of Froddesham, Chesh., and chapel of Gosnarth within Kirkham parish,— Vale Royal. The manor of Ellerbeckes, Yorks., and the manors of Chaddeswiche and Pury alias Pury Courte, Worc.,—purchased from Richard Morryaayn. The manor of Dodington. Oxon,—purchased from Sir Thomas Pope. The manor of Fennycompton, Warw.,—Clatercote priory and Sir Wm. Petre. The manor of Westwell, Oxon, —Eddington mon., Wilts, and Sir Wm. Petre. The manor of Uppeton, Norf., a parcel of the manor of Wendlyng, Norf., and the manors of Swanton Newars, Cardeston, Estwalton, and Woodnorton, Norf.,—Sir Ric. Southwell. The rectory and the advowson of the vicarage of Harrowe, Midd., the lordship and manor of Daventre, and the rectory and vicarage of Daventre and Drayton, Ntht.,—King Henry VIII. 's College. Except bells and leaden roofs and lead upon buildings within the sites of Barnardes College, Rewley mon. and Clatercote priory, if any lead remain there besides the leaden pipes and lead in the windows. Also the rectories of Church Cowley, Burton, Chalgrave, Cavershame, Bensington, Drayton, Overey, Stratton Audeley, Cassington and Enston, Oxon, of Turkeden, Allesworth and Netherwell, Glouc., of Durton, Asshendon and Hillesdon, Bucks., of Mayden Bradley, Wilts, of Ardington, Berks., and of Preston in Craven, Broughton, Carleton, Skipton, Kildwike, Bolton and Leedes, Yorks,—Cathedral of St. Mary of Oxonforth. The rectory of Chippenham, Wilts,—Farleigh priory. The rectory of Charleton, Wilts,— Ederos alias Iveschurche priory, The rectory of Lavington, Wilts,—Eddington mon. The rectory of Estgarston, Berks,—Ambresbury mon., Wilts. 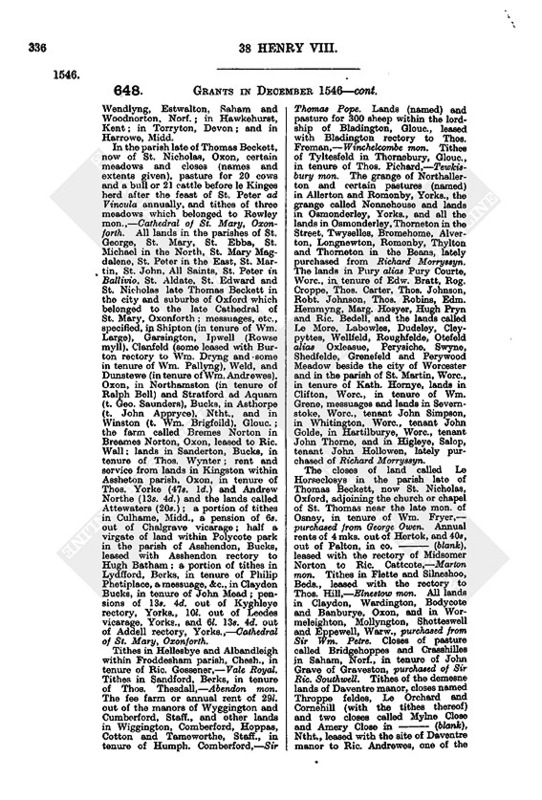 The rectories of Runcorn and Budworthe, Chesh., and of Pyrton, Oxon,— Norton mon. The rectory of Rotharston, Chesh.,—Launde mon., Leic. The rectory of Batheston, Soms.,—Bathe priory. The rectory of Tolpudell, Dors.,—Abbottisbury mon. The rectory and the manor of Southestoke, Oxon,—Eynesham mon. The rectory of Marcham, Berks,—Abendon mon. The rectories of Lathbury and Eston, Bucks,—Lavendon mon. The rectories of Wathe, Fedderston and Bramham, Yorks.,—St. Oswald's mon. The rectory of Thedburye, Glouc.,—Eynesham mon., Oxon. The rectory of Bowdon Magna, Leic., with the advowson of the church; also the rectories and advowsons of Myvod, Pole and Gyllesfeld, co. Montgomery, St. Asaph's dioc,— (Former owners not named). The rectories of Gyldesborough and Ravynsthorp, Ntht.,—purchased from Thos. Gybbes. The rectories of Twynnyng and Bla[dington], Glouc.,— Winchelcombe mon. The rectories of Compton Parva, Thorneburye and Wotton under Edge, Glouc., and of Preston on Stowere, Warw.,— Tewkesbury mon. The rectories of Temple Gwyttyng and Downe Ampney, Glouc.,—St. John's of Jerusalem and Quenyngton preceptory. The rectories of Thorneton in the Beans, Northotrington, Thorneton in le More, Northkilvington and Thorneton in the Street, Yorks., and of Claynes, Worc,—purchased of Ric. Morryssyn. 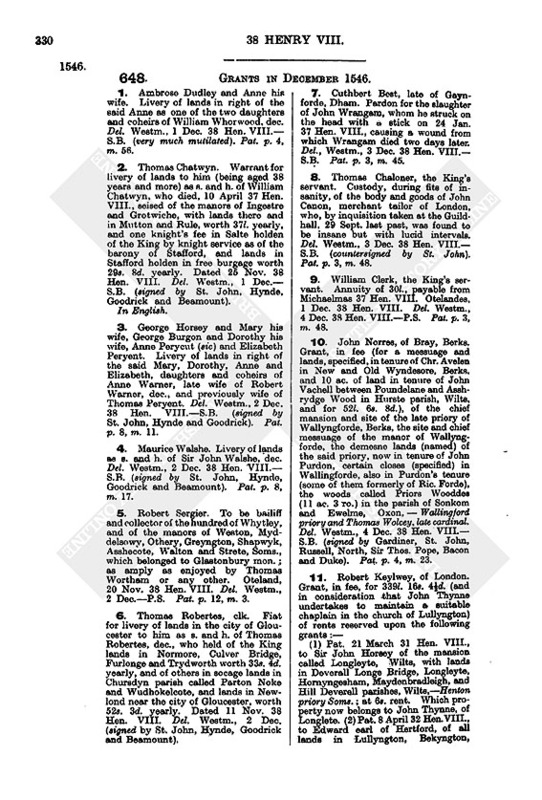 The rectories of Wroxton and Balscott, —purchased of Sir Thos. Pope. The rectory of Norton Broyne, Oxon, —Eynesham mon. The rectory of Flower, Ntht., and of MidsomerNorton, Soms.,—Marton mon., Surr. The rectory of Copull, Beds,—Chixsand mon. The rectory of Flette and Silneshoo, Beds., and of Harringworth, Ntht,—Elmestowe mon. The rectory of Hawkehurste, Kent, and an annual rent of 21l. granted to the King by Sir Wm. Petre during the incumbency of Henry Symon, now rector there; and the rectory of Torryton Magna with St. Giles, Devon, and annual rent of 40l. 8s. 0½d., likewise granted by Petre during the incumbency of John Chamber, now rector; also the advowsons of Hawkehurst and Torryton Magna,—(former owners not named). The rectories of Hampton, Offenham, Badsey, Aldington, Wykanford, Lyttleton Media, Northlyttleton and Southlyttleton, Worc.,—Evesham mon. and the Cathedral of St. Peter. Westminster. The rectory of Badbye, Ntht.,—Evesham mon., Worc. The rectory of Spillesburye, Oxon,—St. Mary's College, Warwick. And the vicarages of the aforesaid churches of Churche Cowley and Barton,— Cathedral of St. Mary, Oxford. The advowsons of the vicarages of Turkeden, Allesworth, Chalgrave, Caversham, Durton, Asshendon, Hyllesdon, Maydon Bradley, Netherwell, Bensington, Drayton, Overye, Ardington, Stratton Audeley, Cassington, Enston, Preston in Craven, Broughton, Carleton, Skipton, Kildwike, Bolton, Leedes, Chippenham, Charleton, Lavington, Estgarston, Runcorne, Budworthe, Pyrton, Kirkham, Froddesham, Rotherston, Batheston, Tolpudell, Southstoke, Marcham, Latheburye, Eston, Wathe, Fedderston, Bramham, Thedburye, Bowdon Magna, Myvodd, Pole, Gyllesfeld, Gyldesborough, Ravinsthorp, Twynnyng, Bladington, Compton Parva, Thorneburye, Wotton under Edge, Preston on Stower, Temple Gwytting, Downe Ampney, Thorneton in the Beans, Northotrington, Thorneton in le More, Northkilvington, Thorneton in the Street, Claynes, Wroxton, Balseott, Norton Broyne, Flower, Mydsomer Norton, Copull, Flette, Silneshdo, Harringworthe, Hawkehurst, Torryton Magna with St. Giles, Hampton, Offenham, Badsey, Aldington, Wykanford, Lyttleton Media, Northlyttleton, Southlyttleton, Badbye, Spillesburye and Harrowe, and all advowaona pertaining to the said manors and the appointment of the master of the school of Rotherston aforesaid. And all appurtenances (of the aforesaid lordships, manors, rectories, vicarages, chapels and parcel of Wendlyng manor) in Binsey, Le Weck, Saynt Margarettes, Well, Worton, Churche Cowley, Sybford, Burton, Clanffelde, Lewe, Chalgrave, Caversham, Bensington, Drayton, Overye, Stratton Audeley, Cassyngton, Enston, Pyrton, Southstoke. Dodyngton, Clifton, Hempton, Ilbury, Wroxton, Balscott, Norton Broyne, Fennycompton, Claydon, Wardington, Bodycote, Banburye, Westwell and Spillesburye, Oxon; in Made Morton, Durton, Asshedon, Polycote, Hillesdon, Lathburye, and Eston, Bucks; in Turkeden, Allesworth, Netherwell, Thedburye, Twynnyng, Bladington, Foscott Hayes called Lyttlewodnam, Compton Parva, Thornbury, Wotton under Edge, Wotton Nybbeley, Wortley, Symondeshall, Synwell, Combe Bradley, Temple Gwything and Downe Ampney, Glouc. ; in Maydon Bradley, Chippenham, Charleton and Lavington, Wilts; in Ardington, Estgarston and Marcham, Berks; in Preston in Craven, Preston, Heleffeld Wykelesworth, Westhalton, Broughton, Carleton, Lodersden, Yeleson, Skipton, Stirton Chorleburye, Emesey, Estbye, Halton, Draugton, Storthes, Hesylwood, Derestones, Kildewyck, Kildewyckgrange, Sellesden, Bridgeendes, Estburne, Cannonwyck, Collynghed, Newhall, Bradley, Bolton, Leedes, Armeley, Ricote Graunge, Chappeltoune, Bramley, Gledow, Allerton Grange, Burley, Hedyngley, Baregraunge: Moregraunge, Ladywoodhouse, Kirkbiston, Cocingley, Kinwesthrope, Potter Newton, Wortley, Skelton, Armeley Hall, Gypton, Colcottes, Osmondthorpe, Himerslett, Woodhouse, Katbeston, Northall, Holbett, Wathe, Wentworth, Hewland, Brampton, Hadywick, Swynton, Fedderston, Whytwood, Preston Jacklyng, Aketon, Loscoo, Bramham, Oglesthorpe, Ellerbeckes, Thorneton in the Beans, Northotrington, Thorneton in le More, Northkilvington and Thorneton in the Street, Yorks., in Runcorne, Budworth, Kirkham, Froddesham, Frikelton, Salwik, Clifton, Treves, Larbeck, Hamolton, Gosnarth, Rotherston, Tatton, Harstall, Wosterne, Meire, Millyngton, Acton, Bollyngton, Northshawe, Mossez, Busshes, Mosse Houses, Northwood, Swynyshed, Norbury, Bothes, Knottisford. Marthall, Ollerton, Tofte, Bexton, Sudlow and Pever, Chesh. ; in Batheston, Mydsomer Norton, Hertok and Palton, Soms. ; in Tolpudell and Southover, Dors. ; in Bowdon Magna, Leic. ; in Myvod, Poole and Gillesfelde, St. Asaph's dioc. ; in Gyldesborough, Ravynsthorpe, Holwell, Cotton, Flowre Harryngworthe, Daventre, Welton, Drayton, Badbye and Newenham, Ntht. ; in Preston on Stower, Fennycompton, Wormeleighton, Mollyngton, Shotteswell and Eppwell, Warw. ; in Chaddeswiche, Purye alias Pury Courte, Claynes, Hampton, Offenham, Badsey, Aldington, Wykanford, Lyttleton Media, Northlyttleton, and Southlyttleton, Wore. ; in Copull, Flete, Sylneshoo, Donton and Temysford, Beds. ; in Uppeton, Birlyngham, Wendlyng, Estwalton, Saham and Woodnorton, Norf. ; in Hawkehurst, Kent; in Torryton, Devon; and in Harrowe, Midd. In the parish late of Thomas Beckett, now of St. Nicholas, Oxon, certain meadows and closes (names and extents given), pasture for 20 cows and a bull or 21 cattle before le Kinges herd after the feast of St. Peter ad Vincula annually, and tithes of three meadows which belonged to Rewley mon.,—Cathedral of St. Mary, Oxonforth. All lands in the parishes of St. George, St. Mary, St. Ebba, St. Michael in the North, St. Mary Magdalene, St. Peter in the East, St. Martin, St. John, All Saints, St. Peter in Ballivio, St. Aldate, St. Edward and St. Nicholas late Thomas Beckett in the city and suburbs of Oxford which belonged to the late Cathedral of St. Mary, Oxonforth; messuages, etc., specified, in Shipton (in tenure of Wm. Large), Garsington, Ipwell (Rowse myll), Clanfeld (some leased with Burton rectory to Wm. Dryng and some in tenure of Wm. Pallyng), Weld, and Dunstewe (in tenure of Wm. Andrewes), Oxon, in Northamston (in tenure of Ralph Bell) and Stratford ad Aquam (t. Geo. 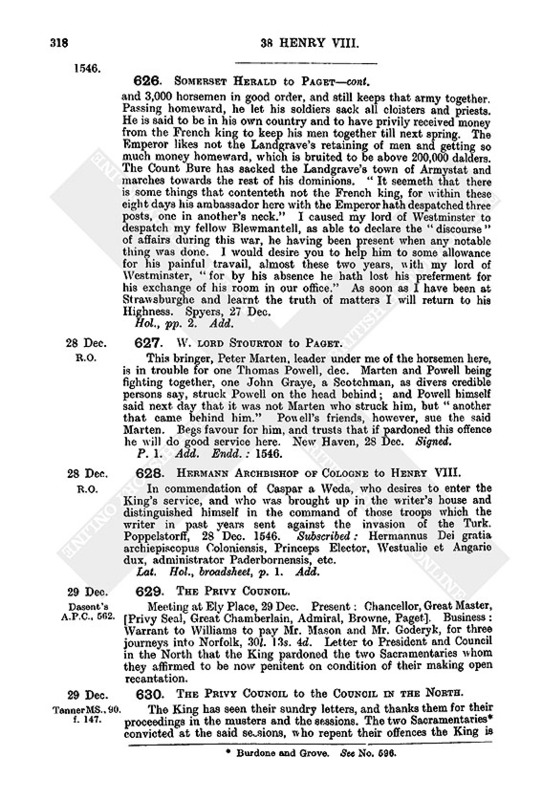 Saunders), Bucks, in Asthorpe (t. John Appryce), Ntht., and in Winston (t. Wm. Brigfeild), Glouc. ; the farm called Bremes Norton in Breames Norton, Oxon, leased to Ric. Wall; lands in Sanderton, Bucks, in tenure of Thos. 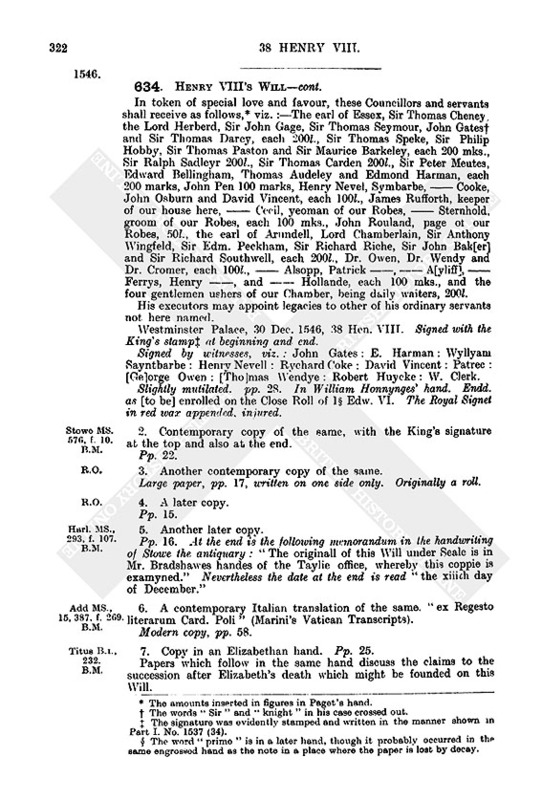 Wynter; rent and service from lands in Kingston within Assheton parish, Oxon, in tenure of Thos. Yorke (47s. 1d.) and Andrew Northe (13s. 4d.) and the lands called Attewaters (20s. ); a portion of tithes in Culhame, Midd., a pension of 6s. out of Chalgrave vicarage; half a virgate of land within Polycote park in the parish of Asshendon, Bucks, leased with Asshendon rectory to Hugh Batham; a portion of tithes in Lydfford, Berks, in tenure of Philip Plietiplace, a messuage, &c, in Claydon Bucks, in tenure of John Mead; pensions of 13s. 4d. out of Kyghleye rectory, Yorks., 10l. out of Leedes vicarage, Yorks., and 6l. 13s. 4d. out of Addell rectory, Yorks.,—Cathedral of St. Mary, Oxonforth. Tithes in Hellesbye and Albandleigh within Froddesham parish, Chesh., in tenure of Ric. Gossener,—Vale Royal. Tithes in Sandford, Berks, in tenure of Thos. Thesdall,—Abendon mon. The fee farm or annual rent of 29l. out of the manors of Wyggington and Cumberford, Staff., and other lands in Wiggington, Comberford, Hoppas, Cotton and Tameworthe, Staff., in tenure of Humph. Comberford,—Sir Thomas Pope. Lands (named) and pasture for 300 sheep within the lordship of Bladington, Glouc., leased with Bladington rectory to Thos. Freman,—Winchelcombe mon. Tithes of Tyltesfeld in Thomebury, Glouc., in tenure of Thos. Pichard,—Tewkisbury mon. The grange of Northallerton and certain pastures (named) in Allerton and Romonby, Yorks., the grange called Nonnehouse and lands in Osmonderley, Yorks., and all the lands in Osmonderley, Thorneton in the Street, Twyselles, Bromehome, Alverton, Longnewton, Romonby, Thylton and Thorneton in the Beans, lately purchased from Richard Morryssyn. The lands in Pury alias Pury Courte, Worc., in tenure of Edw. Bratt, Rog. Croppe, Thos. Carter, Thos. Johnson, Robt. Johnson, Thos. Robins, Edm. Hemmyng, Marg. Hosyer, Hugh Pryn and Ric. Bedell, and the lands called Le More, Labowles, Dudeley, Cleypyttes, Wellfeld, Roughfelde, Otefeld alias Oxleasue, Perysiche, Swyne, Shedfelde, Grenefeld and Perywood Meadow beside the city of Worcester and in the parish of St. Martin, Worc., in tenure of Kath. Hornye, lands in Clifton, Worc., in tenure of Wm. 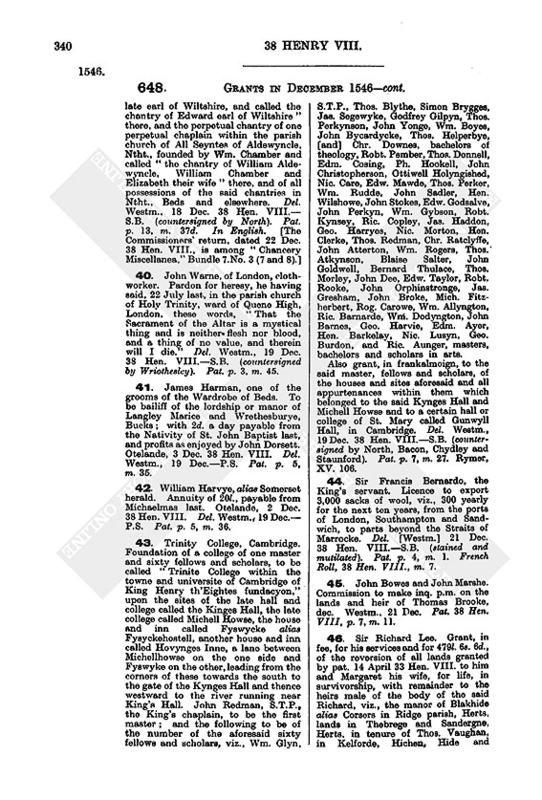 Grene, messuages and lands in Severnstoke, Worc., tenant John Simpson, in Whitington, Worc., tenant John Golde, in Hartilburye, Worc., tenant John Thorne, and in Higleye, Salop, tenant John Hollowen, lately purchased of Richard Morryssyn. The closes of land called Le Horseclosys in the parish late of Thomas Beckett, now St. Nicholas, Oxford, adjoining the church or chapel of St. Thomas near the late mon. of Osney, in tenure of Wm. Fryer,— purchased from George Owen. Annual rents of 4 mks. out of Hertok, and 40s, out of Palton, in co. ——— (blank), leased with the rectory of Midsomer Norton to Ric Cattcote,—Morton mon. Tithes in Flette and Silneshoo, Beds., leased with the rectory to Thos. Hill,—Elnestow mon. All lands in Claydon, Wardington, Bodycote and Banburye, Oxon, and in Wormeleighton, Mollyngton, Shotteswell and Eppewell, Warw., purchased from Sir Wm. Petre. Closes of pasture called Bridgehoppes and Crasshilles in Saham, Norf., in tenure of John Grave of Graveston, purchased of Sir Ric. Southwell. Tithes of the demesne lands of Daventre manor, closes named Throppe feldes, Le Orchard and Cornehill (with the tithes thereof) and two closes called Mylne Close and Amery Close in ——— (blank), Ntht., leased with the site of Daventre manor to Ric. Andrewes, one of the said closes called Throppe feldes lying beside the close in Throppe, Ntht., which Thos. Thobye exchanged with the dean and canons of St. Fridiswide's college for certain lands of his in Thropp,—King Henry VIII. 's College. The garden lying behind King Henry VIII. 's college, in tenure of John Hore, lately parcel of the possessions of the mayor and aldermen of Oxford. The messuage, hall, garden, four cottages, etc., near the place called Frydiswides towards the south gate of Oxford, lately belonging to Nic. Mason, clk. 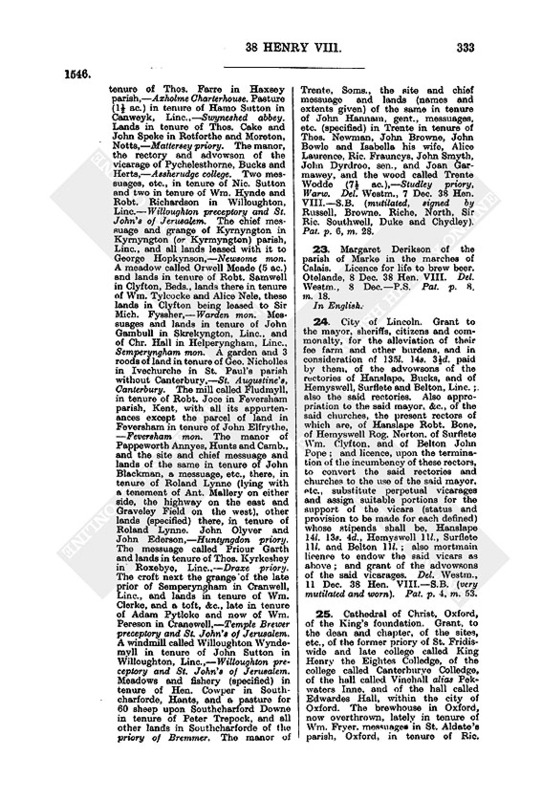 The messuage, etc., in St. Sepulchre's parish without Newgate, London, formerly in tenure of Robt. Reade and now of Sir John lord Mordaunt lately belonging to Sir Edw. North. Also the advowson of Westwell rectory, Oxon,—St. John's of Jerusalem and Sir Wm. Petre. Except the tithes in Skipton assigned to the vicar of Skipton, the oblations of the vicarage of Kildwike, the tithes of the vicarage of Estgarston reserved upon the lease of Estgarston rectory to Wm. Phetiplace, the tithes of the demesne lands of the manor of Twynnyng and other tithes reserved upon the lease of Twynnyng rectory to Charles Hunte, and all tithes of the demesne lands of the late priory of Wroxton and manor of Wroxton and Balscott. Total annual value of the premises 2,200l. To hold in frankalmoign; paying yearly for the tenths of the rectories of Chippenham, Charleton, Buncome, Budworth, Pyrton, Latheburye and Easton 20l. 14s. 10d., and also 52l. 8s. 6d. by the name of annual rent, in lieu of first fruits and tenths. Also pardon and release to Ric. Coxe, S.T.P., King's chaplain, now dean, Wm. Haynes, S.T.B., Wm. Tresham, D.D., Thos. Daye, LL.B., Alex. Belsyre, A.M., John Dyer, A.M., Jas. Curtope, A.M., Thos. Barnard, A.M., and Robt. Bankes, A.M., now prebendaries in the said cathedral, and their successors, of all sums due from them as first fruits. Also grant of the appropriation of the rectory of Hawkehurst upon the death of Hen. Simondes, now rector there, and the advowson of a perpetual vicarage there instead; the said dean and chapter providing a suitable house for the vicar and distributing reasonable alms to the poor parishioners to the extent of 10s., and endowing the vicar with an annual pension of 12l. 10s. 10d. Like grant of appropriation of the rectory of Torryton, upon the death of John Chamber, where the poor shall have alms to the extent of 13s. 4d. and the vicar a pension of 20l. Like appropriation forthwith of the rectory of Magna Bowdon, where the poor shall have alms to the extent of 10s. and the vicar 13l. 6s. 8d. Also appropriation of the rectories of Myvod, Pole and Gillesfelde (without any proviso for vicarages). This grant is subject to no other payments than are aforesaid, except dimissions, and the stipends, salaries, etc., of vicars, curates, stewards, etc. (but the salary of the chaplain celebrating the Mass of St. Mary within the Metropolitan church of York, will henceforth be maintained by the Crown), and except the following annual payments, viz. :— 26s. 8d. to Oxford University out of lands in Oxford, 10s. to the bailiffs of the fee farm of Oxonforth for the rent called "longablour," 19s. 4d. to the bp. of Lincoln for the appropriation of the rectories of Cowley, Hognorton and Burton, 13s. 7¾d. to the archdeacon of Oxford for procurations and synodals from the rectories of Churche Cowley, Hognorton and Burton, 3s. to the bp. of Lincoln for the indemnity of the church of Burton, 2s. to the dean and chapter of Exeter Cathedral for a portion of tithes, 15½d. to the sheriff of Oxford out of Made Morton manor, 7s. for procurations out of Chalgrave rectory, 12s. 6d. to the archd. of Oxford for procurations of the churches which belonged to Dorchester mon., 4s. to the abp. of York for a pension out of Broughton rectory, 1 qr. of wheat, 2 qr. of oats and 1 qr. of barley to the vicar of Broughton, 2s. to the abp. of York for synodals of Broughton, 4s. 6d. to the archd. of York for procurations out of Carleton rectory, 23s. 2d. to the archdeacon of Wiltshire for procurations and synodals out of Chippenham rectory, 3s. 4d. to the dean and chapter of Salisbury for procurations and synodals out of Lavington rectory, 9s. 4½d. to the archd. of Berkshire for procurations and synodals out of Estgarston rectory, 6s. 8d. to the bp. of Salisbury for the indemnity of that rectory, 2s. to the archd. of Berkshire for the same, the price of all the straw arising from the grain of the rectory of Froddesham granted by the Crown to John Johnson for life, 7s. 6d. to the archd. of Chester for procurations and synodals out of Froddesham rectory, 13l. 6s. 8d. to the bp. of Chester for a pension out of Kirkham rectory, 3s. 4d. to the dean and chapter of Lichfield out of the rectory of Rotherston, 3l. 9s. 8d. to the bp. of Co. et Lich. for procurations and synodals out of Rotherston rectory, 3s. 1¼d. to the said bp. for triennial procurations and synodals out of the same rectory, 23l. 6s. 8d. to the vicar of Rotherston and the parish priest there, 10l. to Simon Alen schoolmaster there, 10s. 9d. to the archd. of Dorset for procurations and synodals out of Tollpudell rectory, 20s. to the abp. of York for a pension out of Wathe rectory, 6s. 8d. to the dean and chapter of York for the like, 2s. to the abp. of York for synodals out of the church of Adwyk super Derne within the parish of Wathe, 20s. to the rector of Castelforth, Yorks., for a pension out of Fedderston rectory and a portion of tithes within the township of Whytwood within Fedderston parish, 4s. to the deacons and choristers of the Metropolitan church of York out of Bramham rectory, 30s. out of the said rectory payable to the bailiff of St. Peter, and 20s. to the vicars choral "bederne" of the said Metropolitan church, 13l. 6s. 8d. to the vicar of Bowdon Magna for his salary, 11s. 1½d., to the archd. of Leicester for procurations and synodals of that church, 8l. to the vicar of Twynnyng for his pension, 20s. to the bp. of Worcester for a pension out of Twynnyng rectory, and 2s. 4d. for procurations and synodals, 8s. 5d. to the archd. of Worcester for procurations and synodals out of the same rectory, 6l. 13s. 4d. to the vicar of Bladington for his pension, 53s. 4d. to the bp. of Worcester for a pension out of Thornebury rectory, 5s. for six measures of wheat bought for the singing bread (pro pane ad celebrand.) in the church of Thomebury, 8l. 13s. 4d. to the vicar of Preston upon Stower for his salary, 40s. to the vicar of Flette and Sylneshoo for his pension, the salaries or stipends of the vicars of Hawkehurste and Torryton, 18s. to the bp. of Lincoln's tenants of Cropredy, Oxon, for certain lands in Lawndhill, 4s. to tenants of Brasynoes college in Cropredy, 4l. to the curate of Hampton church for his pension and portion, 10s. to the vicar of the same church for a portion of tithes of wool, 4l. 17s. 4d. to the curate of Offenham church for his pension and portion, 3l. 11s. 4d. to the vicar of the church of Badsey, Aldington and Wikanford for his pension or portion, 3l. 12d. to the vicar of the church of Lyttleton Media, Northlyttleton and Southlyttleton for his pension and portion, 3s. 4d. to the bailiff of the Duchy of Lancaster out of the field called Throppefelde in Throppe, 2s. 4d. to the bailiff of Barkampsted, 3s. 4d. to the sheriff of Northampton, 5s. to the King for the castle ward out of Daventre manor, 8s. 2d. to the bailiff of the Duchy of Lancaster for Haltes Landes in Daventre, 2s. to the archd. of Northampton for procurations out of Daventry rectory, 10s. 6¾d. to the same for procurations and synodals of the same church, 16s. to the proctor of the guild of Holy Trinity in Daventre out of certain lands in Thropp feldes and lands called Hallardes in Throppe,3l. 6s. 8d. to the bp. of Lincoln for a pension out of Badbye rectory, 20d. to the same for procurations out of the same rectory, 17s. 6½d. to the archd. of Peterborough for synodals and procurations out of the same rectory, 40s. to the vicar of Spillesburye for his pension, 42s. to Nicholas Mason, clk., for the aforesaid lands of his in Oxford, 6s. 8d. to the mayor and aldermen of Oxford for the aforesaid garden in tenure of John Hore, 3l. 6s. 8d. to the provost and scholars of Oryell College for the aforesaid stable and close called "a tymberyard" adjoining Canterbury College, 5l. to Sir Edw. North for the premises in St. Sepulchre's parish, and all rents, fees, and other burdens to which farmers of any of the premises are subject. Del. Westm., 11 Dec. 38 Hen. VIII.—S.B. (slightly mutilated, signed by North, Hendle, Bacon, Staunford and Chydley). Pat. p. 8, m. 19. 26. Sir Francis Bernard, native of Venice, the King's servant. Denization. Otelandes, 8 Dec. 38 Hen. VIII. Del. Westm., 12 Dec—P.S. Pat. p. 3, m. 48. 27. William Tirrell, the King's servant. Licence to export 300 dickers of tanned leather backs and hides or so many dozen of "calveskynnes" as shall in custom and subsidy yield the same amount; also licence to import 200 tuns of "Gaiscon wyne and Tholouse whood." Otelande, 8 Dec. 38 Hen. VIII. Del. Westm., 12 Dec—P.S. French Roll m. 1. 28. John Kyttowe. Fiat for livery of lands to him as s. and h. of John Kyttowe, who, as appears by office found 9 July 38 Hen. VIII., died seised of lands (specified, worth 8l. yearly) in the parish of St. Mary Magdalen in Barmondesey, Surr., and other lands in Croydon and Micham, Surr. Dated 24 Nov. 38 Hen. VIII. Del. Westm., 12 Dec.—S.B. (signed by St. John, Hynde and Beamount). 29. Clement Robertes. Fiat for livery of lands to him as s. and h. of Thomas Robertes, who, as appears by two several inquisitions taken in cos. Essex and Herts, died, 1 Dec. 27 Hen. VIII., seised of the manor of Parva Braxsted and lands there and in Wytham Essex and Ilstre, Herts (tenures and annual values given), the said Clement having attained his full age of 21 years on 23 Nov. 38 Hen. VIII. Dated 24 Nov. 38 Hen. VIII. Del. Westm. 12 Dec.—S.B. (signed by St. John, Hynde and Beamount). 30. John Whitehorne of Wortmge, Hants, and Alice his daughter, now wife of Thos. Salmon. Grant, in fee to the said Alice, for 307l. 4s. 4d. paid by the said John, of the lordship and manor of Hunton, Hants, a dovecot, a watermill and a coppice of wood (2 ac.) in Hunton,—Margaret countess of Salisbury. Del. Westm., 13 Dec. 38 Hen. VIII.—S.B. (signed by Russell, Browne, St. John, North, Riche, Duke and Chydley). Pat. p. 3, m. 25. 31. William Giles, clk., King's chaplain. Canonry and prebend of St. Michael in the collegiate church of Beverlaye, Yorks., void by the death of William Dariensis. Assher, 10 Dec. 38 Hen. VIII. Del. Westm., 13 Dec. —P.S. Pat. p. 5, m. 42. Rymer, XV, 106. 32. George Bourchier, the King's servant. To be bailiff of the lordships of Marke and Oye, in the marches of Calais, which office is now void. With 12d. a, day, payable from Michaelmas last, as enjoyed by Thos. Prout, Ric. Knyght, John Rookwood or Jas. Bourchier. Otelande, 2 Dec. 38 Hen. VIII. Del. Westm., 13 Dec.—P.S. French Roll, m. 1. 33. Walter Robertes, of Bristow, merchant. Licence to import 500 tuns of Gascon wine. Otelande, 2 Dec 38 Hen. VIII. Del. Westm., 13 Dec.—P.S. French Roll, m. 7. 34. Sir William Herbert. 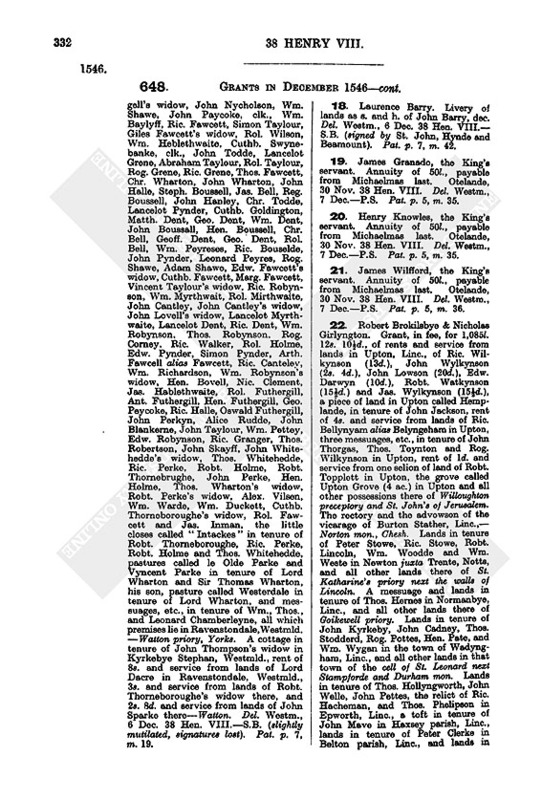 Grant, in fee (for his services) of the lordships and manors of St. Nicholas, St. Michael, St. George, Walterston, Wynvo, and Lammays, co. Glamorgan, which belonged to John Malefaunte formerly husband of the mother of the said Sir William, and all lands of the said John in these places and in Begulis and elsewhere, co. Glamorgan. Del. Westm., 14 Dec. 38 Hen. VIII. — S.B. Pat. p. 3, m. 50. 35. William Ely, groom of the Chamber, and John Lynsey. Licence to import 600 tuns of Gascon and French wines and 200 tuns of woad. Oteland, 4 Dec. 38 Hen. VIII. Del. Westm., 16 Dec.—P.S. French Roll, m. 2. 36. Baptist Borone, the King's servant, a native of Milan in the Emperor's dominions. Denization. Otelandes, 12 Dec 38 Hen. VIII. Del. Westm., 17 Dec.—P.S. Pat. p. 5, m. 42. 37. Richard Cupper. Grant, in fee, for 1797. 13s. 6d., of the farm, manor and hereditament called Hadsore Ferme, in Hadsore, Worc, meadow called Blakemore in tenure of Thos. Gower in Haddesore, the advowson of Haddesore rectory, and woods called Howewoodes and Hasillwoode Coppice (166 ac.) in Hadsore,— Warwykeslandes and Spencerslandes. Del, Westm., 18 Dec. 38 Hen. VIII. —S.B. (signed by Russell, Gardiner, Browne, St. John, Ryche, North, Duke and Staunford). Pat. p. 3, m. 49. 38. Thomas Wymbysh. 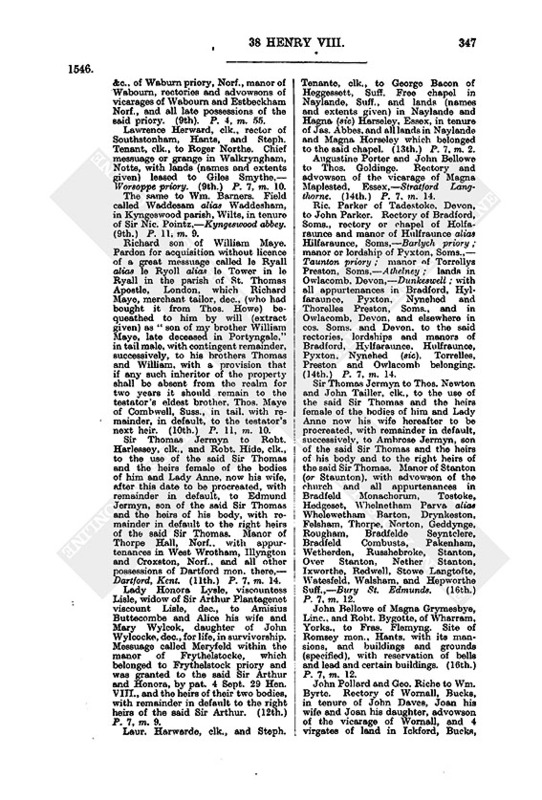 Grant, in fee (for the manors of Rydesdale Bailwick, Rydesdale Collection and Cookedale, Nthld., and the manor of Hesell, co. town of Kingston upon Hull, the advowson of the rectory of Ellesden, Nthld., and all lands which the said Thomas and Lady Elizabeth Taylboys his wife sold to the Crown by indenture, 2 Dec. 38 Hen. VIII., and for 187l. 10d.) of the reversion of the site of Pyxham manor, Worc., and the lands in tenure of Thos. Brokeholden, Wm. More, John Grene and Ric. Bedyll, which Ric. Berde holds for life, rent free; and grant of the whole manor of Pyxham,— Major Malverne mon. ; and all other the King's lands in Pyxham in tenure of Edw. Smyth, ——— Pynnocke, Ric. Cave and Anne Pytcher. Also the manor of Cromb Symondes alias Ellyscrove alias Irlyscrome, Worc., —late earl of Warwick, attainted; and the advowson of the rectory of Irlyscrome. Also all lands in Hanley parish, Worc., which belonged to the mon. of Minor Malverne. Also grant to the said Thomas Wymbysh and Lady Elizabeth Taylboys his wife, in fee to the said Elizabeth, of the manor of Brayles, Warw. Del. Westm., 18 Dec. 38 Hen. VIII. —S.B. (signed by Russell, Gardiner, Paget, North, Williams, Goodrick, and Hendle). Pat. p. 7, m. 25. 40. John Warne, of London, clothworker. Pardon for heresy, he having said, 22 July last, in the parish church of Holy Trinity, ward of Quene High, London, these words, "That the Sacrament of the Altar is a mystical thing and is neither flesh nor blood, and a thing of no value, and therein will I die." Del, Westm., 19 Dec. 38 Hen. VIII.—S.B. (countersigned by Wriothesley). Pat. p. 3, m. 45. 41. James Harman, one of the grooms of the Wardrobe of Beds. To be bailiff of the lordship or manor of Langley Marice and Wrethesburye, Bucks; with 2d. a day payable from the Nativity of St. John Baptist last, and profits as enjoyed by John Dorsett. Otelande, 3 Dec. 38 Hen. VIII. Del. Westm., 19 Dec—P.S. Pat. p. 5, m. 35. 42. William Harvye, alias Somerset herald. Annuity of 20l., payable from Michaelmas last. Otelande, 2 Dec. 38 Hen. VIII. Del. Westm., 19 Dec— P.S. Pat. p. 5, m. 36. 43. Trinity College, Cambridge. Foundation of a college of one master and sixty fellows and scholars, to be called "Trinite College within the towne and universite of Cambridge of King Henry th'Eightes fundacyon," upon the sites of the late hall and college called the Kinges Hall, the late college called Michell Howse, the house and inn called Fyswycke alias Fysyckehostell, another house and inn called Hovynges Inne, a lane between Michellhowse on the one side and Fyswyke on the other, leading from the corners of these towards the south to the gate of the Kynges Hall and thence westward to the river running near King's Hall. John Redman, S.T.P., the King's chaplain, to be the first master; and the following to be of the number of the aforesaid sixty fellows and scholars, viz., Wm. Glyn, S.T.P., Thos. Blythe, Simon Brygges, Jas. Segewyke, Godfrey Gilpyn, Thos. Perkynson, John Yonge, Wm. Boyes, John Bycardycke, Thos. Helperbye, [and] Chr. Downes, bachelors of theology, Robt. Pember, Thos. Donnell, Edm. Cosing, Ph. Hookell, John Christopherson, Ottiwell Holyngished, Nic. Care, Edw. Mawde, Thos. Perker, Wm. Rudde, John Sadler, Hen. Wilshowe, John Stokes, Edw. Godsalve, John Perkyn, Wm. Gybson, Robt. Kynsey, Ric. Copley, Jas. Haddon, Geo. Harryes, Nic. Morton, Hen. Clerke, Thos. Redman, Chr. Ratclyffe, John Atterton, Wm. Rogers, Thos.' Atkynson, Blaise Salter, John Goldwell, Bernard Thulace, Thos. Morley, John Dee, Edw. Taylor, Robt. Rooke, John Orphinstronge, Jas. Gresham, John Broke, Mich. Fitzherbert, Rog. Carowe, Wm. Allyngton, Ric. Barnarde, Wm. Dodyngton, John Barnes, Geo. Harvie, Edm. Ayer, Hen. Barkelay, Nic. Lusyn, Geo. Burdon, and Ric. Aunger, masters, bachelors and scholars in arts. Also grant, in frankalmoign, to the said master, fellows and scholars, of the houses and sites aforesaid and all appurtenances within them which belonged to the said Kynges Hall and Michell Howse and to a certain hall or college of St. Mary called Gunwyll Hall, in Cambridge. Del. Westm., 19 Dec. 38 Hen. VIII.—S.B. (countersigned by North, Bacon, Chydley and Staunford). Pat. p. 7, m. 27. Rymer, XV. 106. 44. Sir Francis Bernardo, the King's servant. Licence to export 3,000 sacks of wool, viz., 300 yearly for the next ten years, from the ports of London, Southampton and Sandwich, to parts beyond the Straits of Marrocke. Del. [Westm.] 21 Dec. 38 Hen. VIII.—S.B. (stained and mutilated). Pat. p. 4, m. 1. French Roll, 38 Hen. VIII., m. 7. 45. John Bowes and John Marshe. Commission to make inq. p.m. on the lands and heir of Thomas Brooke, dec. Westm., 21 Dec. Pat. 38 Hen. VIII, p. 7, m. 11. 46. Sir Richard Lee. Grant, in fee, for his services and for 479l. 6s. 6d., of the reversion of all lands granted by pat. 14 April 33 Hen. VIII. to him and Margaret his wife, for life, in survivorship, with remainder to the heirs male of the body of the said Richard, viz., the manor of Blakhide alias Corsers in Ridge parish, Herts, lands in Thebrege and Sandergne, Herts, in tenure of Thos. Vaughan, in Kelforde, Hichen, Hide and Wallyngforde, Herts, and Palloxhill, Beds, in tenure of Thos. Maydwell, a messuage called Rawdisshe, with meadow called Southmeade and lands in Shenley parish, Herts, in tenure of Sir John Cutt, and rent of 3l. 7s. 10d. from the same, lands in Ridge parish in tenure of John Crubbe, and lands in the towns of Hatfeld, Titnangre, St. Alban's, Southmymes and Colney, Herts, and in Wymer juxta Margate, Beds, which belonged to Soppewell priory, and tithes in Hichen and Palloxhill in tenure of Thos. Maydwell, except buildings in the town of St. Albans,—Soppewell nunnery. Also grant of a, messuage, &c, in the parish of St. Michael within the town of St. Albans, in tenure of Edw. Smyth, closes (12 ac.) called Culverclose and Pursers Felde lying beyond Hallywell near Eywood in the parishes of St. Michael and St. Stephen in St. Albans in tenure of John Sible, and a grove called Priors Grove (2 ac.) beyond Dorwoldwood, in St. Stephen's parish, in tenure of John Maynerd,— St. Albans mon. The rectory of Stokelile, Ntht., in tenure of Edw. Lone, and the advowson of the vicarage of Stokelile,—Cathedral church of Christ and St. Mary of Oxenford. The farms called Oldhall in the parish of Magna Haddam, Herts, in tenure of John Rawlyn, and Byggynges in Magna Haddam and Standon, Herts, in tenure of Robt. Grane, and the wood called Lady wood Coppice (14 ac.) in these parishes—Gertrude marchioness of Exeter, attainted. Del. Westm., 21 Dec. 38 Hen. VIII.—S.B. (much injured, signed by Sir Ric. Southwell, Sir Robt. Southwell, North, Bacon and Chydley). Pat. p. 8, m. 15. 48. Sir Edward Northe, Sir Thomas Moyle, Walter Myldemaye, Richard Gooderick and John Goosnolde. Commission to take the account of Sir Hugh Poulet, late treasurer of Bolloigne, admitting as sufficient the account which he has already made to Sir Richard Southwell, sent as special commissioner to Boloynge, which account extends from 13 Sept. 36 Hen. VIII to 29 Jan. 37 Hen. VIII and has been examined before the General Surveyors. Del. Westm., 22 Dec. 38 Hen. VIII—S.B. (countersigned by North, Moyle, Mildemaye, and Duke). Pat. p. 3, m. 31d. 49. Anthony Fortescue, the King's servant. To be marshal of the army in Ireland, vice Sir Osburn Ichingham, dec, with 32 light horsemen under him, having 4s. a day for himself and 9d. a day for each man; also authority to appoint provosts, seneschals and other officers of justice within his office, and keepers of his gaols, and to hold the Court called "The Marschalles Courte," etc. Otelande, 2 Dec. 38 Hen. VIII Del. Westm., 23 Dec— P.S. Pat. p. 5, m. 43. 50. Sir Thomas Cawerden, a gentleman of the Privy Chamber, and Elizabeth his wife. Grant, in survivorship, with remainder to the right heirs of the said Sir Thomas (for the manor or farm of Hextalles in Blechynglye, Surr., granted to them by pat. 25 May 36 Hen. VIII and for the surrender of that patent) of the site, &c, of Lyngfeild college, Surr., a water mill called Newlond Mylle; a messuage and lands called Byattes in Lyngfeild and all the King's lands there; the rectory and the advowson of the vicarage of Lyngfeild; the lordship or manor of Hexsted with its appurtenances in Hexsted, Lyngfeild and Lymmesfeld, Surr. ; lands called Innettes in Lyngfeild; the lordship or manor of Byllesherst, Surr. ; lands called Martens, Byllesherst Parke, and Jordeyns, Surr., and Calcottes in Tattysfeld, Surr. ; the inn called le Grene Dragon or Cobham's Inn in St. Saviour's parish in Southwark, Surr. ; lands in Westram, Kent, called Peynters, Lotte and Forles Londes; the lordship or manor of Squyrrys, Kent, with lands called Lytlecote; the lordships or manors of Peryto and Broke, Kent; lands in Westwell, Kent, lately in occupation of Augustine Atwell; lands called Colle Alleyns in Cowden, Kent, the lordship and manor of Hothelyghe. Suss, and Kent, and lands in Lamberherste, Suss., in tenure of John Streter Also grant of the aforesaid manor of Hextalles, Surr., alias the farm of Hexstalles in Blechynglye, Surr., in which the said Sir Thomas and Elizabeth now dwell. 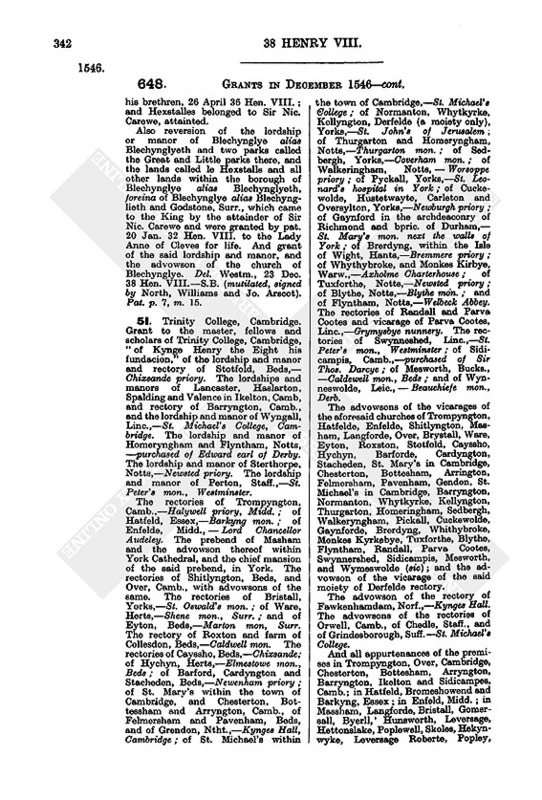 And grant of all possessions of the said late college All which premises, except Hexstalles, belonged to the said college and came to the King by surrender of Edw. Culpeper, clk., LL.D., late master, and his brethren, 26 April 36 Hen. VIII. ; and Hexstalles belonged to Sir Nic. Carewe, attainted. Also reversion of the lordship or manor of Blechynglye alias Blechynglyeth and two parks called the Great and Little parks there, and the lands called le He xstails and all other lands within the borough of Blechynglye alias Blechynglyeth, foreina of Blechynglye alias Blechynglieth and Godstone, Surr., which came to the King by the attainder of Sir Nic. Carewe and were granted by pat. 20 Jan. 32 Hen. VIII. to the Lady Anne of Cleves for life. And grant of the said lordship and manor, and the advowson of the church of Blechynglye. Del. Westm., 23 Dec. 38 Hen. VIII.—S.B. (mutilated, signed by North, Williams and Jo. Arscot). Pat. p. 7, m. 15. 51. Trinity College, Cambridge. Grant to the master, fellows and scholars of Trinity College, Cambridge, "of Kynge Henry the Eight his fundacion," of the lordship and manor and rectory of Stotfold, Beds,— Chixsande priory. The lordships and manors of Lancaster, Haslarton, Spalding and Valence in Ikelton, Camb, and rectory of Barryngton, Camb., and the lordship and manor of Wyngall, Linc.,—St. Michael's College, Cambridge. The lordship and manor of Homeryngham and Flyntham, Notts, —purchased of Edward earl of Derby. The lordship and manor of Sterthorpe, Notts,—Newsted priory. The lordship and manor of Perton, Staff.,—St. Peter's mon., Westminster. The rectories of Trompyngton, Camb.,—Halywell priory, Midd. ; of Hatfeld, Essex,—Barkyng mon. ; of Enfelde, Midd., — Lord Chancellor Audeley. The prebend of Masham and the advowson thereof within York Cathedral, and the chief mansion of the said prebend, in York. The rectories of Shitlyngton, Beds, and Over, Camb., with advowsons of the same. The rectories of Bristall, Yorks,—St. Oswald's mon. ; of Ware, Herts,—Shene mon., Surr. ; and of Eyton, Beds,—Marton mon, Surr. The rectory of Roxton and farm of Collesdon, Beds,—Caldwell mon. The rectories of Cayssho, Beds,—Chixsande; of Hychyn, Herts,—Elmestowe mon., Beds; of Barford, Cardyngton and Stacheden, Beds,—Newenham priory; of St. Mary's within the town of Cambridge, and Chesterton, Bottessham and Arryngton, Camb., of Felmersham and Pavenham, Beds, and of Grendon, Ntht.,—Kynges Hall, Cambridge; of St. Michael's within the town of Cambridge,—St. Michael's College; of Normanton, Whytkyrke, Kollyngton, Derfelde (a moiety only), Yorks,—St. John's of Jerusalem; of Thurgarton and Homeryngham, Notts,—Thurgarton mon. ; of Sedbergh, Yorks,—Coverham mon. ; of Walkeringham, Notts, — Worsoppe priory; of Pyckall, Yorks,—St. Leonard's hospital in York; of Cuckewolde, Hustetwayte, Carleton and Oversylton, Yorks,—Newburgh priory; of Gaynford in the archdeaconry of Richmond and bpric. of Durham,— St. Mary's mon. next the walls of York; of Brerdyng, within the Isle of Wight, Hants,—Bremmere priory; of Whythybroke, and Monkes Kirbye, Warw.,—Axholme Charterhouse; of Tuxforthe, Notts,—Newsted priory; of Blythe, Notts,—Blythe mon. ; and of Flyntham, Notts,—Welbeck Abbey. The rectories of Randall and Parva Cootes and vicarage of Parva Cootes, Line,—Grymysbye nunnery. The rectories of Swynneshed, Linc.,—St. Peter's mon., Westminster; of Sidicampis, Camb.,—purchased of Sir Thos. Darcye; of Mesworth, Bucks., —Caldewell mon., Beds; and of Wynneswolde, Leic., — Beauchiefe mon., Derb. The advowsons of the vicarages of the aforesaid churches of Trompyngton, Hatfelde, Enfelde, Shitlyngton, Masham, Langforde, Over, Brystall, Ware, Eyton, Roxston, Stotfold, Cayssho, Hychyn, Barforde, Cardyngton, Stacheden, St. Mary's in Cambridge, Chesterton, Bottesham, Arrington, Felmersham, Pavenham, Gendon, St. Michael's in Cambridge, Barryngton, Normanton, Whytkyrke, Kellyngton, Thurgarton, Homeringham, Sedbergh, Walkeryngham, Pickall, Cuckewolde, Gaynforde, Brerdyng, Whithybroke, Monkes Kyrkebye, Tuxforthe, Blythe, Flyntham, Randall, Parva Cootes, Swynnershed, Sidicampis, Mesworth, and Wymeswolde (sic); and the advowson of the vicarage of the said moiety of Derfelde rectory. The advowson of the rectory of Fawkenhamdam, Norf.,—Kynges Hall. The advowsons of the rectories of Orwell, Camb., of Chedle, Staff., and of Grindesborough, Suff. — St. Michael's College. 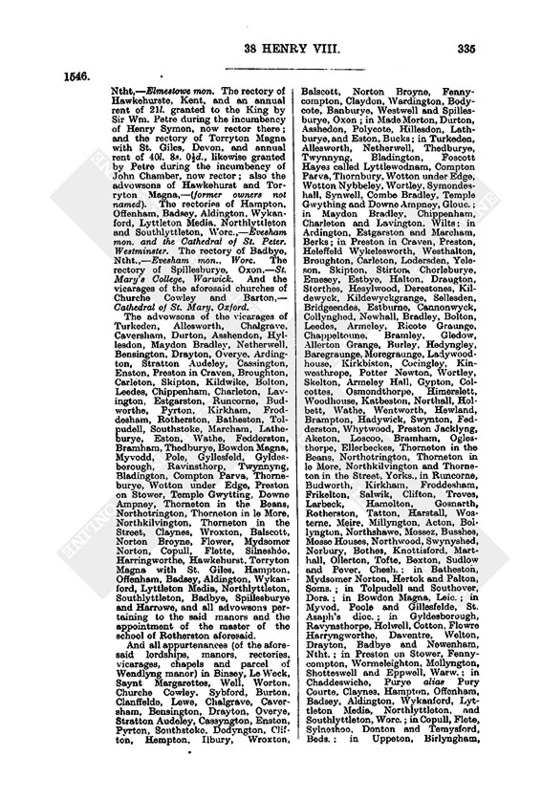 And all appurtenances of the premises in Trompyngton, Over, Cambridge, Chesterton, Bottesham, Arryngton, Barryngton, Ikelton and Sidicampes, Camb. ; in Hatfeld, Bromeshowend and Barkyng, Essex; in Enfold, Midd. ; in Massham, Langforde, Bristall, Gomersall, Byerll,' Hunsworth, Leversage, Hettonslake, Poplewell, Skoles, Hekynwyke, Leversage Roberte, Popley, Over Wykes, Netherwykes, Aethwalton, Drithlingtowne, Okenshawe, Normanton, Whytkyrke, Kyllyngton, Derffeld, Sedbergh, Aynderbye Werne, Cuckwolde, Newburgh, Bylande, Yatis, Baxeby, Ulleston, Thome super le Hyll, Angron, Braxebye, Byrdefurthe, Wyldon Grange, Thorneton super Montem, Carleton juxta Hustwayte, Carleton, Oversilton, Ulveston, Gresley, Yeresley, Yeresley Pele, the grange of Hoode and Ange.rame grange, Yorks. ; in Shytlyngton, Eyton, Roxston, Collesdon, Stotfold, Cayssho, Barforde, Cardyngton, Wetherwell, Stacheden, Felmersham and Pavenham, Beds; in Ware, Hychen, Welburye, Offeley, Wymondley and Ippoleth, Herts; in Grendon, Ntht. ; in Wyngall, Randall, Parva Cootes and Swyneshed, Linc. ; in Thurgarton, Homeringham, Flyntham, Hoveringham, Walkeringham, Tuxforth, Tuxforthe in le Claye, Fryer Parke, Blythe, Torworth, Byllingley, Haughton, Marre, Hallefeld, Boughton super Kerne, Bawtrie, Austerfeld, Bramcote, Stokewell, Weston, Elton, Langton, Flintham and Sterthorp, Notts; in Brerding, Hants; in Wythebroke, Warw. ; in Kyrkby, Monkes Kyrkby, Gasnell, Newbolt Hurste, Brynkelowhill, Stretston, Brokehurste, Stretton, Newenham, Coppeston, Paytyngton alias Payleton, Walton Feld, Cosserde, Ullesthorpp, Longlawforde, Walton, Newbolde Revall, Brynkelowhurste, Hello, Sesterwover and Lawforde, Warw. and Leic. ; in Perton, Staff. ; in Gaynesforth, Peresbridge, Denton, Bolholme, Barnaycastell, Langton, Hedelaham, Somerhouse, Whorleton, Awent, Cletham, Seleby, Wyneston, Houghton, Moreton, Stanton, Theperlande alias Stretlem, Sledwyshe, and Brumlowe, Bpric. of Durham; in Crofte, Richemonde, Hawkeswell, and Patrickbrumpton, archdeaconry of Richmond, Yorks. ; in Mesworth Bucks; in Wymeswolde, Leic., and elsewhere. Also tithes in Bromeshowend in Berkyng parish, in tenure of Thos. Josselyn,—Berkyng. All lands in the town of Cambridge and in Chesterton and Hynton, Camb., which belonged to Kynges Hall, a rent of 5l. 6s. 8d. paid by the sheriff of Cambridgeshire, a rent of 20l. paid by the sheriff of Bedfordshire, the fee farm of the town of Scarburgh, Yorks, and all lands in Scarburgh, and all possessions of Kinges Hall in the town of Cambridge, Chesterton, Hynton, Bottesham, Arrington, Felmersham, Pavenham, Grendon and Scarburgh, and elsewhere, except a rent of 33l. 6s. 8d. out of the late mon. of Sawtrye, lately paid by Sir Ric. Williams alias Crumwell dec.,—the Kinges Hall in Cambridge. 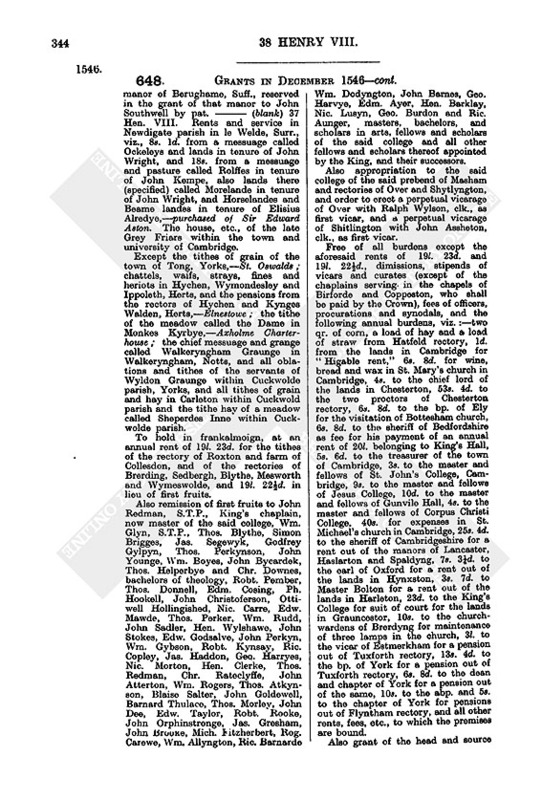 Also all lands in the town of Cambridge, Chesterforde, Hynxston, Foxston, Haslyngfeld, Harleton, Grancester and Orwell, Camb., in Mildenhall, Suff., in the parish of St. Lawrence within the city of London, and elsewhere in cos. Camb., Linc., Suff. and London, which belonged to St. Michael's College, Cambridge. Rent of 6d. and service from lands of Thos. Horsepole in Thurgarton, Notts, and all lands of Thurgarton priory there in tenure of John Pycrofte, Isabella Bower, Agnes Dyxson, widow, Hugh Pecke, Robt. Patenson, Thos. Paler, Thos. Bynche, Laur. Pyper, Thos. Maselande, John Clyfton, Wm. Hollande, John Blakborne, John Herson, John Smyth, Wm. Hixson, Dennis Butcherd, Otuell Nixson, Lewis Sutton, John Richerde, Hen. Mottesforth, John Sherdowne, Marg. Pye, widow, Hugh Stanley, John Fright, Ric. Kirkebye, John Thickholyns, John Pyers, Hen. Smyth, Eliz. Jenkyn, Robt. Cowper, John Foxe, Wm. Houseman, John Thomas, Ric. Hawly, Wm. Pele, Rog. Derley, Wm. Kempe, Robt. Godfrey, Rog. Berye, Wm. Bunebye, Ric. Crampton, John Derley, Robt. Cobyn, Robt. Metham, Wm. Fyssher, John Richardeson, Hen. Inkersell, John Patenson, Robt. Procter, Geo. Barbor, Geo. Scotter and Marg. his "consort," Chr. Madder, John Brodforth, Wm. Amore, Geo. Bridge, Dennis Butcherde, Cecilia his wife and Joan their daughter, Thos. Inkersell, Wm. Raynolde, Thos. Burton, Wm. Lambe and Wm. Raynolde; also all rents, services and other issues from lands in Homeryngham of John Jefferey, Robt. Mower, John Dyon and Robt. Peper and all the lands in Homerunghame in tenure of the relict of Wm. Peper, sen., the relict of Wm. Peper, jun., Peter Bradsha, Robt. Morley, Robt. Plowman and Robt. Peper, the chief mansion of Homeringham manor and lands leased with it to Ric Northe, and the water mill called Snelling Mylle in Homeringhame in tenure of Barth. Orme — Thurgarton priory. Pensions of 40s. out of the rectory of Creke, Leic., and 53s. 4d. out of the rectory of Sherneforde, Leic., — Axholme Charterhouse; 3l. 6s. 8d. out of the church of Weston Notts, 26s. 8d. out of the church of Elton, Notts, and 40s. out of the church of Laughton, Notts,—Blythe mon. Lands in Grymysbye, Randall, Biidgeley, Asshebye, Clee, Stalyngburgh, Heningbye, Lincoln, Scarthow, Thoresway, Wyllyngham, Swallowe, Bradley, Hewton, Swyneflett, and Southkelsey, Linc.,— Grymesbye priory and St. Peter's cathedral, Westminster. Rent of 26l. 13s. 4d. and services from the manor of Berughame, Suff., reserved in the grant of that manor to John Southwell by pat. ——— (blank) 37 Hen. VIII. Rents and service in Newdigate parish in le Welde, Surr., viz., 8s. 1d. from a messuage called Ockeleys and lands in tenure of John Wright, and 18s. from a messuage and pasture called Rolffes in tenure of John Kempe, also lands there (specified) called Morelande in tenure of John Wright, and Horselandes and Beame landes in tenure of Elisius Alredye,—purchased of Sir Edward Aston. The house, etc., of the late Grey Friars within the town and university of Cambridge. Except the tithes of grain of the town of Tong, Yorks,—St. Oswalds; chattels, waifs, strays, fines and heriots in Hychen, Wymondesley and Ippoleth, Herts, and the pensions from the rectors of Hychen and Kynges Walden, Herts,—Elnestowe; the tithe of the meadow called the Dame in Monkes Kyrbye,—Axholme Charterhouse; the chief messuage and grange called Walkeryngham Graunge in Walkeryngham, Notts, and all oblations and tithes of the servants of Wyldon Graunge within Cuckwolde parish, Yorks, and all tithes of grain and hay in Carleton within Cuckwold parish and the tithe hay of a meadow called Sheperdes Inne within Cuckwolde parish. To hold in frankalmoign, at an annual rent of 19l. 23d. for the tithes of the rectory of Roxton and farm of Collesdon, and of the rectories of Brerding, Sedbergh, Blythe, Mesworth and Wymeswolde, and 19l. 22½d. in lieu of first fruits. Also remission of first fruits to John Redman, S.T.P., King's chaplain, now master of the said college, Wm. Glyn, S.T.P., Thos. Blythe, Simon Brigges, Jas. Segewyk, Godfrey Gylpyn, Thos. Perkynson, John Younge, Wm. Boyes, John Bycardek, Thos. Helperbye and Chr. Downes, bachelors of theology, Robt. Pember, Thos. Donnell, Edm. Cosing, Ph. Hookell, John Christoferson, Ottiwell Hollingished, Nic. Carre, Edw. Mawde, Thos. Perker, Wm. Rudd, John Sadler, Hen. Wylshawe, John Stokes, Edw. Godsalve, John Perkyn, Wm. Gybson, Robt. Kynsay, Ric. Copley, Jas. Haddon, Geo. Harryes, Nic. Morton, Hen. Clerke, Thos. Redman, Chr. Rateclyffe, John Atterton, Wm. Rogers, Thos. Atkynson, Blaise Salter, John Goldewell, Barnard Thulace, Thos. Morley, John Dee, Edw. Taylor, Robt. Rooke, John Orphinstronge, Jas. Gresham, John Brooke, Mich. litzherbert, Rog. Care we, Wm. Allyngton, Ric. Barnarde Wm. Dodyngton, John Barnes, Geo. Harvye, Edm. Ayer, Hen. Barklay, Nic. Lusyn, Geo. Burdon and Ric. Aunger, masters, bachelors, and scholars in arts, fellows and scholars of the said college and all other fellows and scholars thereof appointed by the King, and their successors. Also appropriation to the said college of the said prebend of Masham and rectories of Over and Shytlyngton, and order to erect a perpetual vicarage of Over with Ralph Wylson, clk., as first vicar, and a perpetual vicarage of Shitlington with John Assheton, clk., as first vicar. Free of all burdens except the aforesaid rents of 19l. 23d. and 19l. 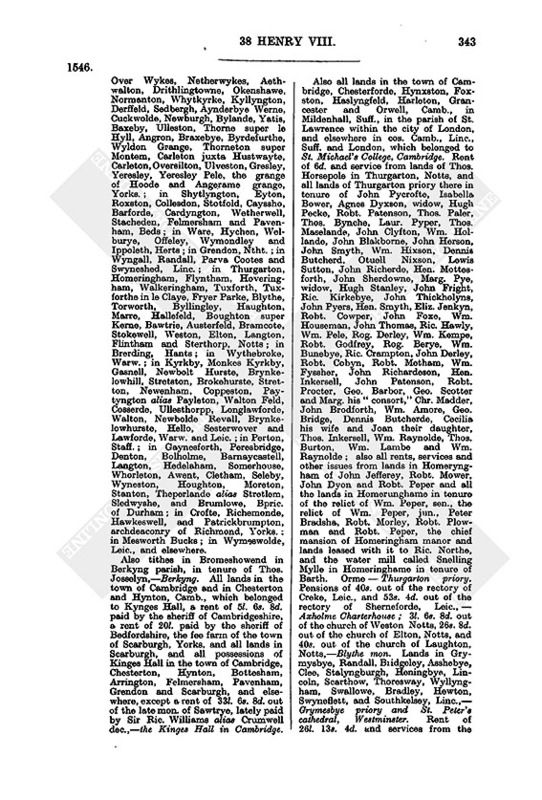 22½d., dimissions, stipends of vicars and curates (except of the chaplains servingin the chapels of Birforde and Coppeston, who shall be paid by the Crown), fees of officers, procurations and synodals, and the following annual burdens, viz. :—two qr. of corn, a load of hay and a load of straw from Hatfeld rectory, 1d. from the lands in Cambridge for "Higable rent," 6s. 8d. for wine, bread and wax in St. Mary's church in Cambridge, 4s. to the chief lord of the lands in Chesterton, 53s. 4d. to the two proctors of Chesterton rectory, 6s. 8d. to the bp. of Ely for the visitation of Bottesham church, 6s. 8d. to the sheriff of Bedfordshire as fee for his payment of an annual rent of 20l. belonging to King's Hall, 5s. 6d. to the treasurer of the town of Cambridge, 3s. to the master and fellows of St. John's College, Cambridge, 9s. to the master and fellows of Jesus College, 10d. to the master and fellows of Gunvile Hall, 4s. to the master and fellows of Corpus Christi College, 40s. for expenses in St. Michael's church in Cambridge, 25s. 4d. to the sheriff of Cambridgeshire for a rent out of the manors of Lancaster, Haslarton and Spaldyng, 7s. 3¼d. to the earl of Oxford for a rent out of the lands in Hynxston, 3s. 7d. to Master Bolton for a rent out of the lands in Harleton, 23d. to the King's College for suit of court for the lands in Grauncestor, 10s. to the churchwardens of Brerdyng for maintenance of three lamps in the church, 3l. to the vicar of Estmerkham for a pension out of Tuxforth rectory, 13s. 4d. to the bp. of York for a pension out of Tuxforth rectory, 6s. 8d. to the dean and chapter of York for a pension out of the same, 10s. to the abp. and 5s. to the chapter of York for pensions out of Flyntham rectory, and all other rents, fees, etc., to which the premises are bound. 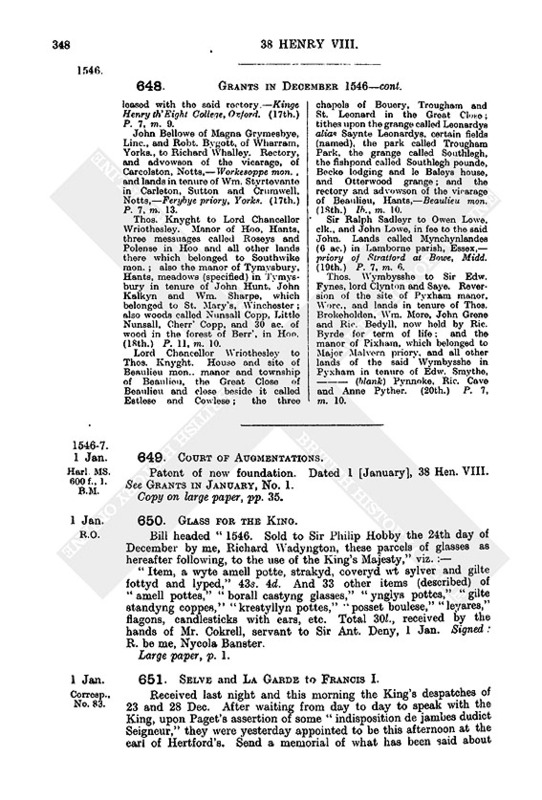 Also grant of the head and source of a canal or aqueduct situated in a certain common belonging to the town of Cambridge with all the aqueducts leading thereform to the site of the said college which belonged to the late King's Hall and Grey Friars. Del. Westm., 24 Dec, 38 Hen. VIII. —S.B. (slightly mutilated, signed by North, Bacon, Chydley and Staunford). Pat. p. 6, m. 19. 52. Sir Edward Mountagu, chief justice of Common Pleas. Grant, in fee (no monetary or other consideration mentioned) of the site of the late perpetual chantry of two chaplains in the parish church of St. Peter of Luffewick, Ntht., founded by Edward late earl of Wiltshire and called the chantry of Edward earl of Wiltshire, the chaplains being called chaplains of the earl of Wiltshire. Also grant of the mansion in Luffewick called the Chauntry House, and the manor of Culworthe alias Colleworthe, Beds., belonging to the said chantry. Also grant of the late perpetual chantry of one perpetual chaplain in the parish church of All Saints, Aldewyncle, Ntht., founded by Wm. Chamber and called the chantry of William Aldewyncle, William Chambers and Elizabeth their wife in the parish church of Aldewyncle, the mansion called the Chantrey House in Aldewyncle, and the manors of Armeston and Denforde, Ntht., belonging to the said chantry. And all appurtenances of the premises in Luffewick, Aldewyncle, Armeston, Denforde, Benefelde and Pokebroke, Ntht., and in Culworthe, Colleworthe, Suldrop alias Sulderock, Sharnebroke alias Sharnebrock, Femysham, Odell, Newenton and Overdene, Beds, and elsewhere; seisin of which has been taken for the King by Wm. Dudley, John Mollesworth and Hen. Freman by virtue of a commission directed to them and others. Del. Westm., 27 Dec. 38 Hen. VIII.—S.B. (signed by North). Pat. p. 7, m. 36. 53. Hugh Jones, a groom of the Chamber. To be bailiff of the manor or lordship of Crokehorne, Soms., in the King's hands by the attainder of Henry late marquis of Exeter; with 8l. 13s. 4d. yearly; as amply as Nicholas Fortescue held the office. Otelande, 5 Dec, 38 Hen. VIII. Del. Westm., 28 Dec—P.S. Pat. p. 5, m. 43. 54. Thomas Seex. Grant, for his services in distilling waters for the King, of an annuity of 13l. 6s. 8d. and also 24s. for his livery. Westm., 22 Dec, 38 Hen. VIII. Del. Westm., 28 Dec.—P.S. Pat. p. 5, m. 43. 55. Roger Williams. Lease, by advice of Daunce and Moyle, of all the lands in Cardigan, the town of Kilgarran, Llangeby, Pennarthe, Llanduy Brevy, Mabonyon, Kerwedros, Spety Jevan, Llanrusted, Mevenneth, Kilnennon and Hannymok, co. Cardigan, in the King's hands by the attainder of Rese Griffith; except a certain rent or custom called "Commortha" payable every third year by the tenants of Kilkennon and Hannynyoke, and except woods, wardships, marriages, escheats, mines, quarries, and other royalties; for 21 years from Michaelmas last; at 21l. 2s. 4d. rent and 2s. increase. Westm., 22 Dec. 38 Hen. VIII. Del. Westm., 28 Dec.—P.S. Pat. p. 5, m. 46. 56. Thomas Coxe, yeoman of the Pantry. 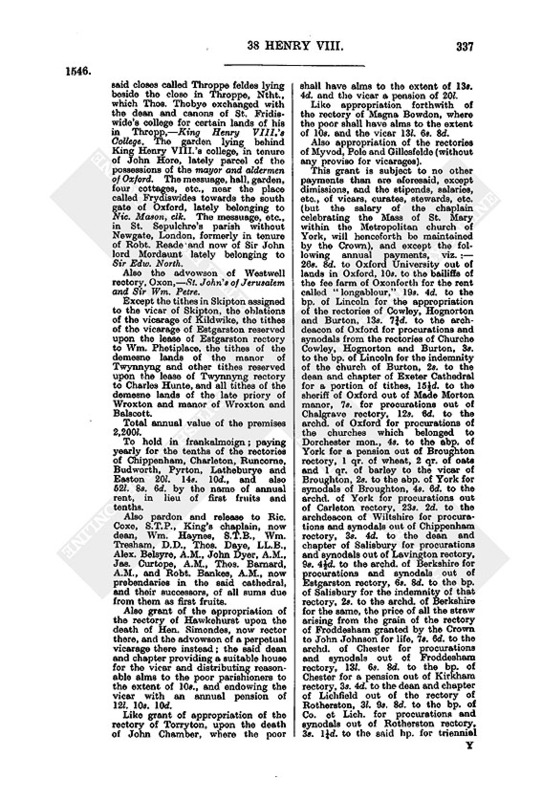 Grant for life of two tenements in the parish of St. Giles without Criplegate, in the suburbs of London, which Wm. Cowper, dec., had; rent free, with profits since Cowper's decease. Oteland, 30 Nov. 38 Hen. VIII. Del. Westm., 28 Dec—P.S. Pat. p. 5, m. 46. 57. Elizabeth Williams. Lease, by advice of Southwell and Moyle, of the site of the manor of Hope, Heref., which belonged to Leominster priory and came to the King by the attainder of the late prior there (sic); for 21 years from Michaelmas last, at 11l. rent and 4s. increase. Nonsuche, 15 Dec. 38 Hen. VIII. Del. Westm., 28 Dec. —P.S. Pat. p. 5, m. 46. 58. Hugh Rogers, one of the officers of the King's ewry, and John Saunders, one of the officers of the Leashe. Office of bailiff of the lordship or manor of Sutton within the forest of Galtresse, Yorks., vice Reginald Whiteacres; in survivorship; with the usual fees and profits, and an annuity of 3l. out of the issues of Burstewike manor in Holdernes, in the King's hands by the attainder of Edward late duke of Buckingham. Otelande, 2 Dec. 38 Hen. VIII. Del. Westm., 28 Dec—P.S. Pat. p. 5, m. 46. 59. John Brydgys, the King's servant. To be the King's tailor, vice John Malte, dec, with 12d. a day, payable from Michaelmas last. Westm., 23 Dec. 38 Hen. VIII. Del. Westm., 28 Dec—P.S. Pat. p. 6, m. 27 (cancelled because surrendered 21 April, 1 Eliz.). 60. Sir Anthony Dennye, chief gentleman of the Privy Chamber. Licence to export within the next two years 2,000 qr. of wheat, 600 tuns of beer, 600 dickers of leather and 600 dickers of calf skins, counting ten doz. to the dicker. Del. Westm., 28 Dec. 38 Hen. VIII.—S.B. (filed, wrongly, in January). French Roll, m. 9. 61. John Gate, a gentleman of the Privy Chamber. 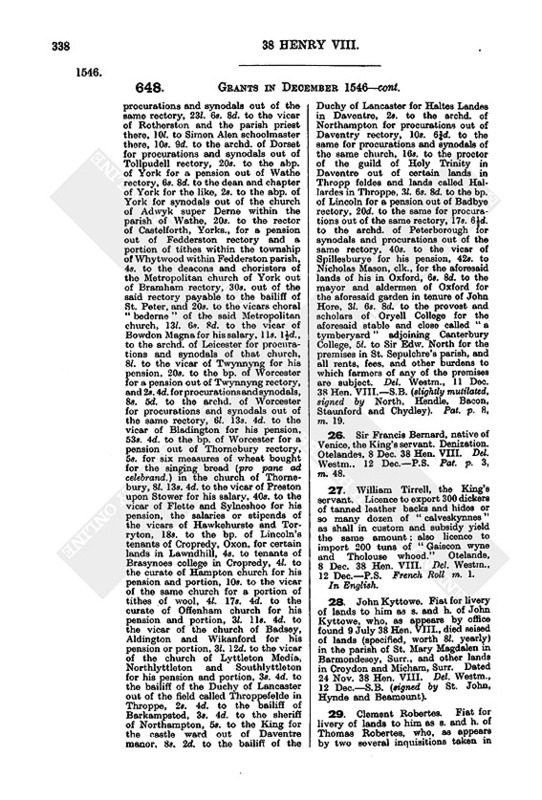 Grant, in fee, for his services, of the late college of Placye alias Plecye, Essex, the house, site, buildings, etc., of the same, the rectory of Placye, the manors of Southe Fambrige and Barneston, the advowson of Placye vicarage, tithes which the vicar of Waltham Magna, Essex, paid to the said college, the manors of Whitstaple and Buckyngfeld, Kent, the rectory and the advowson of the vicarage of Whitstaple, the manor of Welles alias Welbury, Herts, and all other possessions of the said college. Westm., 30 Dec. 38 Hen. VIII. Del. Westm., 31 Dec—P.S. Pat, p. 5, m. 47. Edward earl of Hertford, K.G., Great Chamberlain, to Robt. Keylwey of the Inner Temple, London. Manor of Homyngton, and advowsons of the parish church of Homyngton and of a chantry in the parish church of St. Thomas in Salisbury. (1st.) Pat. p. 7, m. 7. John Adee to Hugh Westwood, Ric. Tyndale, and John Hodges, to the use of the said Adee for life with remainder as follows, viz., one moiety to the use of Nic. Adee and Alice Bery, upon the marriage to be between them, and of the heirs of their two bodies, with remainder, in default of such heirs, to the heirs of the body of the said Nicholas, the other moiety to the use of the said Nicholas and the heirs of his body begotten upon the said Alice, with remainder in default to the said Nicholas and the heirs of his body, with remainder of the whole, in default, to the right heirs of the said John Adee. 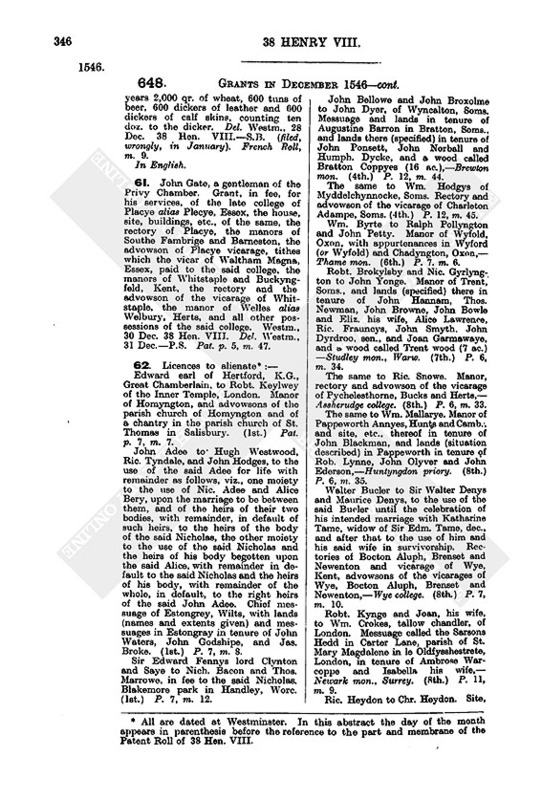 Chief messuage of Estongrey, Wilts, with lands (names and extents given) and messuages in Estongray in tenure of John Waters, John Godshipe, and Jas. Broke. (1st.) P. 7, m. 8. Sir Edward Fennys lord Clynton and Saye to Nich. Bacon and Thos. Marrowe, in fee to the said Nicholas. Blakemore park in Handley, Worc. (1st.) P. 7, m. 12. John Bellowe and John Broxolme to John Dyer, of Wyncalton, Soms. 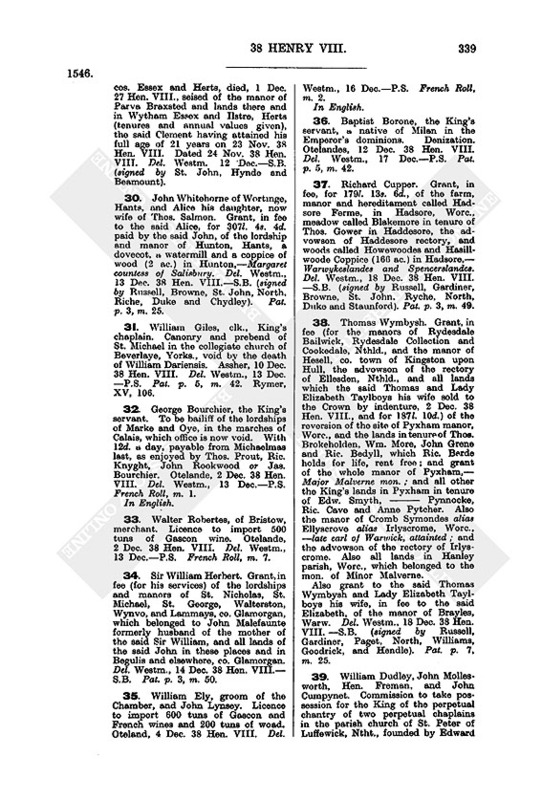 Messuage and lands in tenure of Augustine Barron in Bratton, Soms., and lands there (specified) in tenure of John Ponsett, John Norball and Humph. Dycke, and a wood called Bratton Coppyes (16 ac),—Brewton mon. (4th.) P. 12, m. 44. The same to Wm. Hodgyg of Myddelchynnocke, Soms. Rectory and advowson of the vicarage of Charleton Adampe, Soms. (4th.) P. 12, m. 45. Wm. Byrte to Ralph Pollyngton and John Petty. Manor of Wyfold, Oxon, with appurtenances in Wyford (or Wyfold) and Chadyngton, Oxon,— Thame mon. (6th.) P. 7. m. 6. Robt. Brokylsby and Nic. Gyrlyngton to John Yonge. Manor of Trent, Soms., and lands (specified) there in tenure of John Hannam, Thos. Newman, John Browne, John Bowie and Eliz. his wife, Alice Lawrence, Ric. Frauncys, John Smyth. John Dyrdroo, sen., and Joan Garmawaye, and a. wood called Trent wood (7 ac.) —Studley mon., Warw. (7th.) P. 6, m. 34. The same to Ric. Snowe. Manor, rectory and advowson of the vicarage of Pychelesthorne, Bucks and Herts,— Assherudge college. (8th.) P. 6, m. 33. The same to Wm. Mallarye. Manor of Pappeworth Annyes, Hunts andCamb. 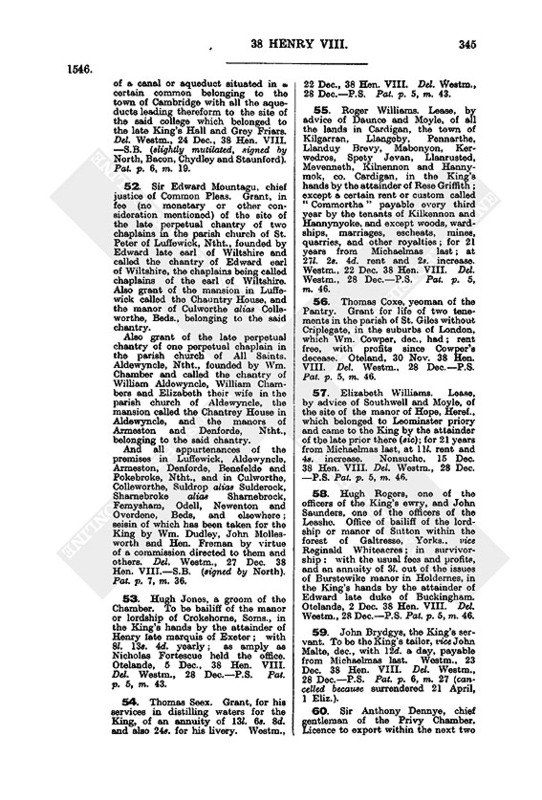 ; and site, etc., thereof in tenure of John Blackman, and lands (situation described) in Pappeworth in tenure of Rob. Lynne, John Olyver and John Ederson,—Huntyngdon priory. (8th.) P. 6, m. 35. Walter Bucler to Sir Walter Denys and Maurice Denys, to the use of the said Bucler until the celebration of his intended marriage with Katharine Tame, widow of Sir Edm. Tame, dec., and after that to the use of him and his said wife in survivorship. Rectories of Bocton Aluph, Brenset and Newenton and vicarage of Wye, Kent, advowsons of the vicarages of Wye, Bocton Aluph, Brenset and Newenton,—Wye college. (8th.) P. 7, m. 10. Robt. Kynge and Joan, his wife, to Wm. Crokes, tallow chandler, of London. Messuage called the Sarsons Hedd in Carter Lane, parish of St. Mary Magdalene in le Oldfysshestrete, London, in tenure of Ambrose Warcoppe and Isabella his wife,— Newark mon., Surrey. (8th.) P. 11, m. 9. Ric. Heydon to Chr. Heydon. Site, &c. of Waburn priory, Norf., manor of Wabourn, rectories and advowsons of vicarages of Wabourn and Estbeckham Norf., and all late possessions of the said priory. (9th). P. 4, m. 55. Lawrence Herward, clk., rector of Southstonham, Hants, and Steph. Tenant, clk., to Roger Northe. Chief messuage or grange in Walkryngham, Notts, with lands (names and extents given) leased to Giles Smythe,— Worsoppe priory. (9th.) P. 7, m. 10. The same to Wm. Barners. Field called Waddesam alias Waddesham, in Kyngeswood parish, Wilts, in tenure of Sir Nic. Pointz,—Kyngeswood abbey. (9th.) P. 11; m. 9. Richard son of William Maye. Pardon for acquisition without licence of a great messuage called le Ryall alias le Ryoll alias le Tower in le Ryall in the parish of St. Thomas Apostle, London, which Richard Maye, merchant tailor, dec., (who had bought it from Thos. 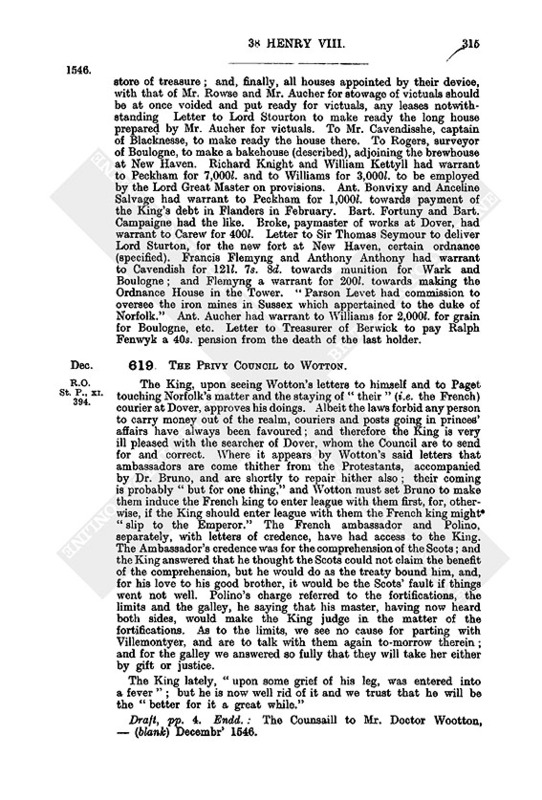 Howe) bequeathed to him by will (extract given) as "son of my brother William Maye, late deceased in Portyngale," in tail male, with contingent remainder, successively, to his brothers Thomas and William, with a provision that if any such inheritor of the property shall be absent from the realm for two years it should remain to the testator's eldest brother, Thos. Maye of Comb well, Suss., in tail, with remainder, in default, to the testator's next heir. (10th.) P. 11, m. 10. Sir Thomas Jermyn to Robt. Harlessey, clk., and Robt. Hide, clk., to the use of the said Sir Thomas and the heirs female of the bodies of him and Lady Anne, now his wife, after this date to be procreated, with remainder in default, to Edmund Jermyn, son of the said Sir Thomas and the heirs of his body, with remainder in default to the right heirs of the said Sir Thomas. Manor of Thorpe Hall, Norf., with appurtenances in West Wrotham, Illyngton and Croxston, Norf., and all other possessions of Dartford mon. there,— Dartford, Kent. (11th.) P. 7, m. 14. Lady Honora Lysle, viscountess Lisle, widow of Sir Arthur Plantagenet viscount Lisle, dec., to Amisius Buttecombe and Alice his wife and Mary Wylcok, daughter of John Wylcocke, dec., for life, in survivorship. Messuage called Meryfeld within the manor of Frythelstocke, which belonged to Frythelstock priory and was granted to the said Sir Arthur and Honora, by pat. 4 Sept. 29 Hen. VIII., and the heirs of their two bodies, with remainder in default to the right heirs of the said Sir Arthur. (12th.) P. 7, m. 9. Laur. Harwarde, clk., and Steph. Tenante, clk., to George Bacon of Heggessett, Suff. Free chapel in Naylande, Suff., and lands (names and extents given) in Naylande and Hagna (sic) Harseley, Essex, in tenure of Jas. Abbes, and all lands in Naylande and Magna Horseley which belonged to the said chapel. (13th.) P. 7, m. 2. Augustine Porter and John Bellowe to Thos. Goldinge. Rectory and advowson of the vicarage of Magna Maplested, Essex,—Stratford Langthorne. (14th.) P. 7, m. 14. Ric. Parker of Tadestoke, Devon, to John Parker. Rectory of Bradford, Soms., rectory or chapel of Holfaraunce and manor of Hulfraunce alias Hilfaraunce, Soms,—Barlych priory; manor or lordship of Pyxton, Soms.,— Taunton priory; manor of Torrellys Preston, Soms,—Athelney; lands in Owlacomb, Devon,—Dunkeswell; with all appurtenances in Bradford, Hylfaraunce, Pyxton, Nynehed and Thorelles Preston, Soms., and in Owlacomb, Devon, and elsewhere in cos. Soms. and Devon, to the said rectories, lordships and manors of Bradford, Hylfaraunce, Hulfraunce, Pyxton, Nynehed (sic), Torrelles, Preston and Owlacomb belonging. (14th.) P. 7, m. 14. Sir Thomas Jermyn to Thos. Newton and John Tailler, clk., to the use of the said Sir Thomas and the heirs female of the bodies of him and Lady Anne now his wife hereafter to be procreated, with remainder in default, successively, to Ambrose Jermyn, son of the said Sir Thomas and the heirs of his body and to the right heirs of the said Sir Thomas. Manor of Stanton (or Staunton), with advowson of the church and all appurtenances in Bradfeld Monachorum, Tostoke, Hedgeset, Whelnetham Parva alias Whelewetham Barton, Drynkeston, Felsham, Thorpe, Norton, Geddynge, Rougham, Bradfelde Seyntclere, Bradfeld Combusta, Pakenham, Wetherden, Russhebroke, Stanton, Over Stanton, Nether Stanton, Ixworthe, Redwell, Stowe Langtofte, Watesfeld, Walsham, and Hepworthe Suff.,—Bury St. Edmunds. (16th.) P. 7, m. 12. John Bellowe of Magna Grymesbye, Linc., and Robt. Bygotte, of Wharram, Yorks., to Fras. Flemyng. Site of Romsey mon., Hants, with its mansions, and buildings and grounds (specified), with reservation of bells and lead and certain buildings. (16th.) P. 7, m. 12. John Pollard and Geo. Riche to Wm. Byrte. Rectory of Wornall, Bucks, in tenure of John Daves, Joan his wife and Joan his daughter, advowson of the vicarage of Wornall, and 4 virgates of land in Ickford, Bucks, leased with the said rectory.—Kinge Henry th'Eight College, Oxford. (17th.) P. 7, m. 9. John Bellowe of Magna Grymesbye, Linc., and Robt. 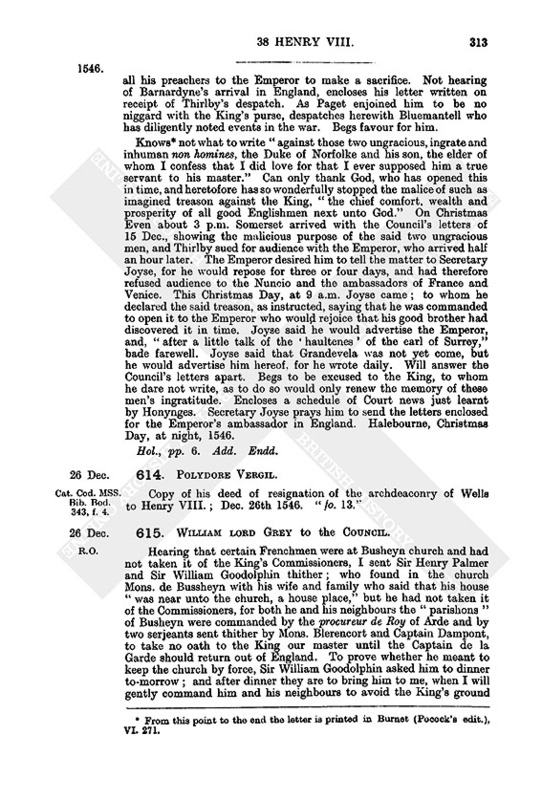 Bygott, of Wharram, Yorks., to Richard Whalley. Rectory, and advowson of the vicarage, of Carcolaton, Notts,—Workesoppe mon., and lands in tenure of Wm. Styrtevante in Carleton, Sutton and Crumwell, Notts,—Ferybye priory, Yorks. (17th.) P. 7, m. 13. Thos. Knyght to Lord Chancellor Wriothesley. Manor of Hoo, Hants, three messuages called Roseys and Polense in Hoo and all other lands there which belonged to Southwike mon. ; also the manor of Tymysbury, Hants, meadows (specified) in Tymysbury in tenure of John Hunt, John Kalkyn and Wm. Sharpe, which belonged to St. Mary's, Winchester; also woods called Nunsall Copp, Little Nunsall, Cherr' Copp, and 30 ac. of wood in the forest of Berr', in Hoo. (18th.) P. 11, m. 10. Lord Chancellor Wriothesley to Thos. Knyght. House and site of Beaulieu mon., manor and township of Beaulieu, the Great Close of Beaulieu and close beside it called Estlese and Cowlese; the three chapels of Bouery, Trougham and St. Leonard in the Great Close; tithes upon the grange called Leonardys alias Saynte Leonardys, certain fields (named), the park called Trougham Park, the grange called Southlegh, the fishpond called Southlegh pounde, Becke lodging and le Baleys house, and Otterwood grange; and the rectory and advowson of the vicarage of Beaulieu, Hants,—Beaulieu mon. (18th.) Ib., m. 10. Sir Ralph Sadleyr to Owen Lowe, clk., and John Lowe, in fee to the said John. Lands called Mynchynlandes (6 ac.) in Lamborne parish, Essex,— priory of Stratford at Bowe, Midd. (19th.) P. 7, m. 6. Thos. Wymbysshe to Sir Edw. Fynes, lord Clynton and Saye. Reversion of the site of Pyxham manor, Worc., and lands in tenure of Thos. Brokeholden, Wm. More, John Grene and Ric. Bedyll, now held by Ric. Byrde for term of life; and the manor of Pixham, which belonged to Major Malvern priory, and all other lands of the said Wymbysshe in Pyxham in tenure of Edw. Smythe, ———(blank) Pynnoke, Ric. Cave and Anne Pyther. (20th.) P. 7, m. 10.
n2. Burdone and Grove. See No. 596.
n3. Space has been left and these amounts written in by Honnynges. n4. The amounts inserted in figures in Paget's hand. n5. The amounts inserted in figures in Paget's hand. n6. The words "Sir" and "knight" in his case crossed out. n7. The signature was evidently stamped and written in the manner shown in Part i. No. 1537 (34). n8. The word "primo" is in a later hand, though it probably occurred in the same engrossed hand as the note in a place where the paper is lost by decay. n10. According to Hall's Chronicle, p. 867, Anne Askew, John Lacelles, gent., Nicholas Otterden, priest, and John Adlam, a tailor, were burned in Smithfield, 16 July 1546. Foxe (v. 550) gives the name of the third as Nicholas Belenian, a priest of Shorpshire; but Wriothesley calls him John Henley, priest, of Essex. n12. Preferred by Mr. Secretary Pagett. n13. Subscribed by the Chancellor of Augmentations. n14. Subscribed by the Chancellor of Augmentations. n15. Preferred by Mr. Secretary Pagett. n17. Subscribed by the Chancellor and others of the Court of Augmentations newly erected. n18. Subscribed by the Chancellor of Augmentations. n19. Preferred by Mr. Secretary Pagett. n20. All are dated at Westminster. In this abstract the day of the month appears in parenthesis before the reference to the part and membrane of the Patent Roll of 38 Hen. VIII.